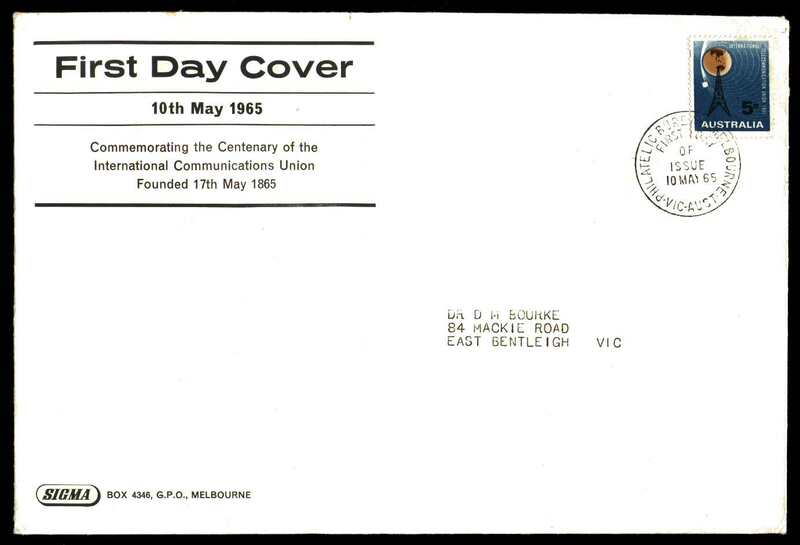 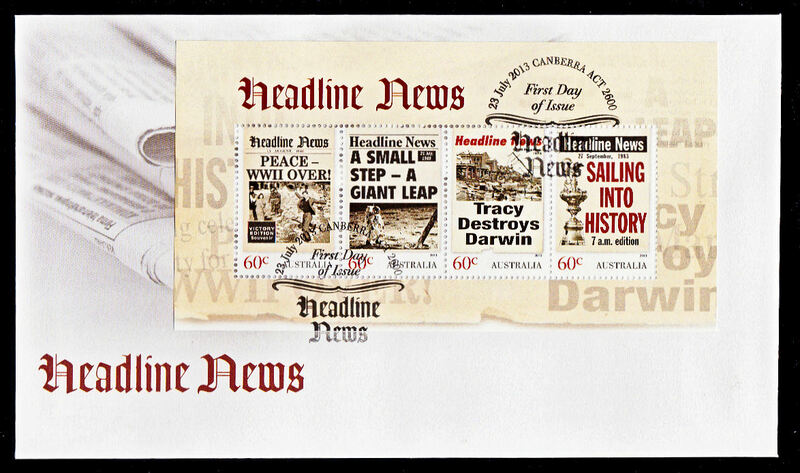 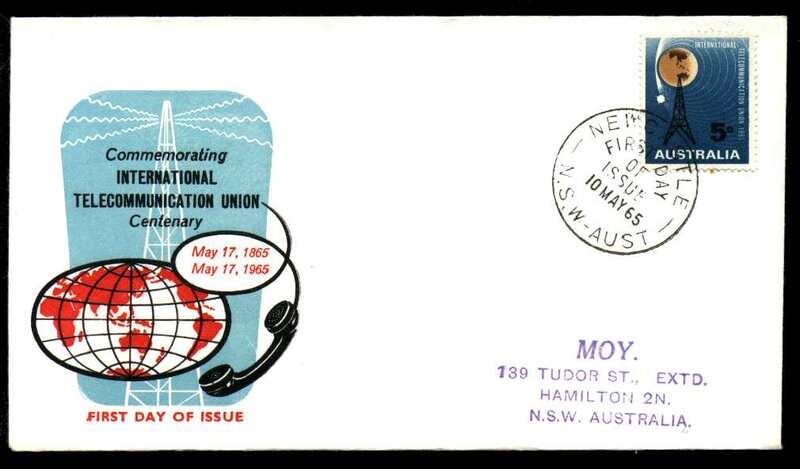 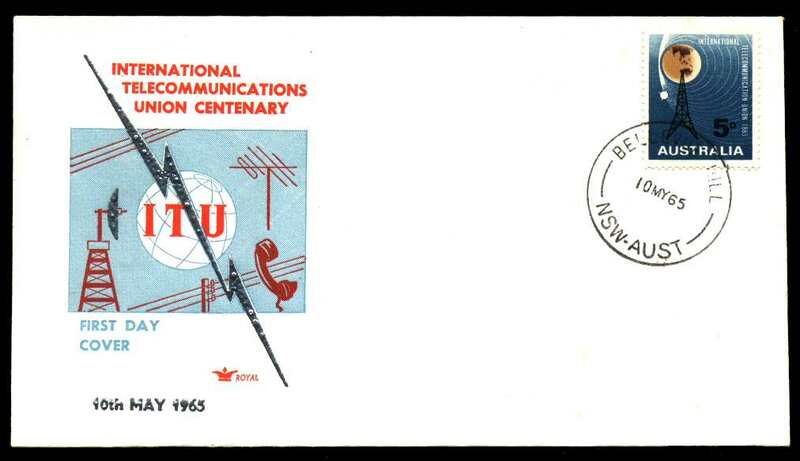 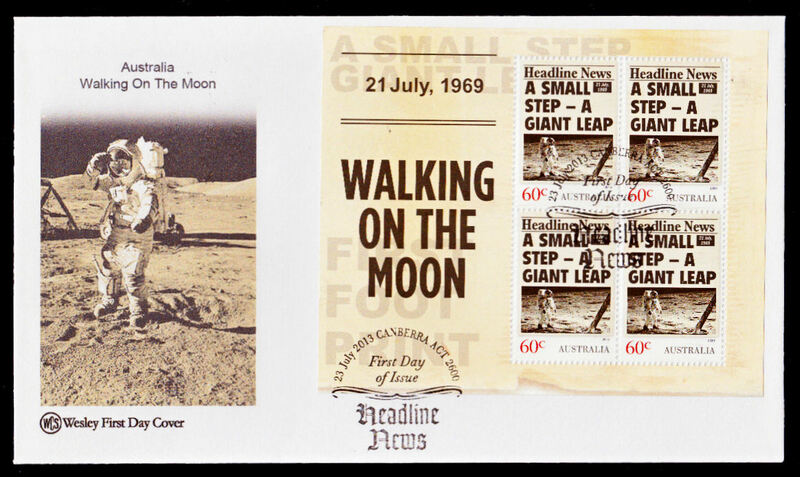 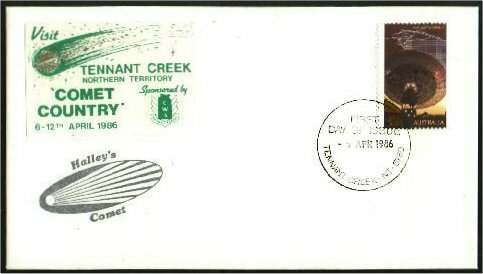 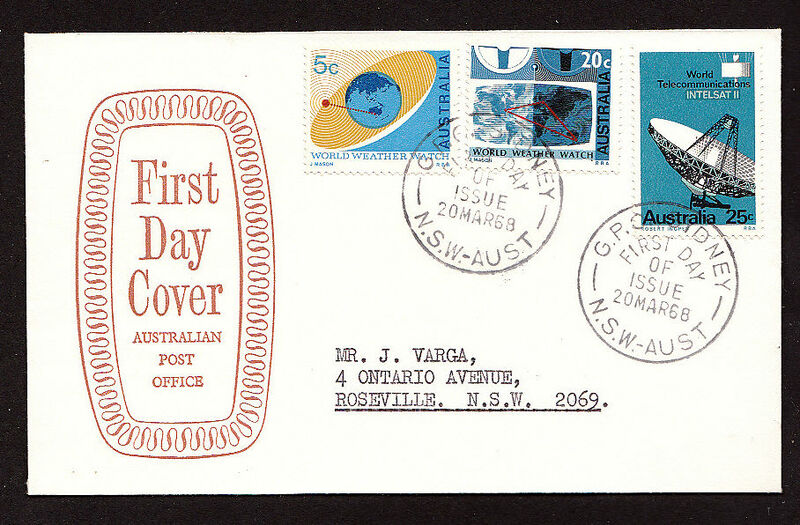 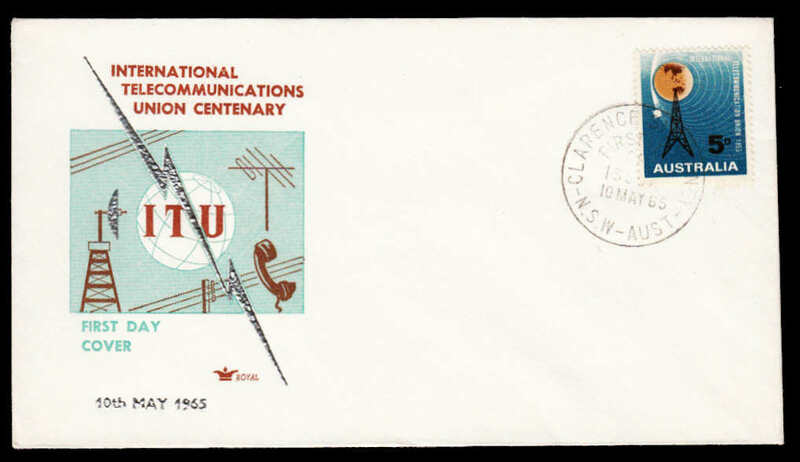 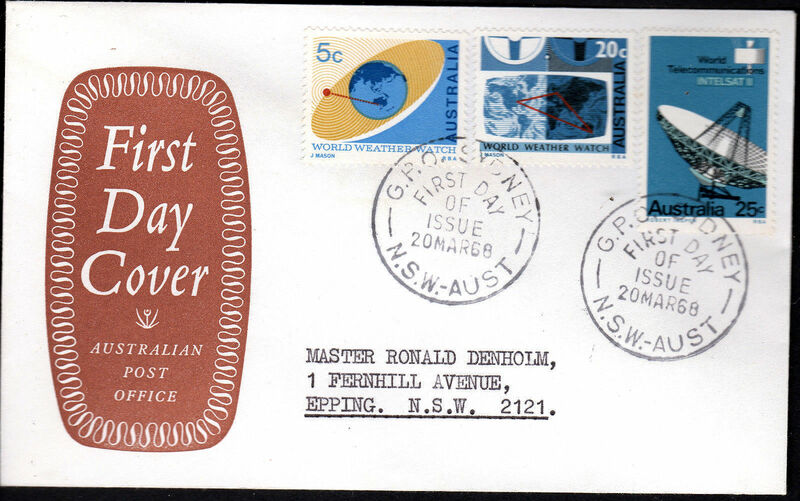 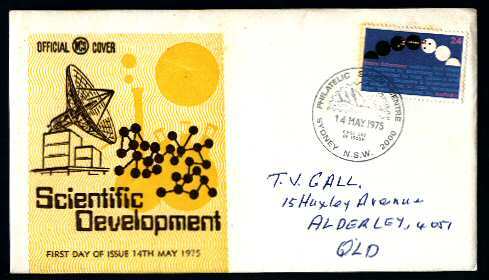 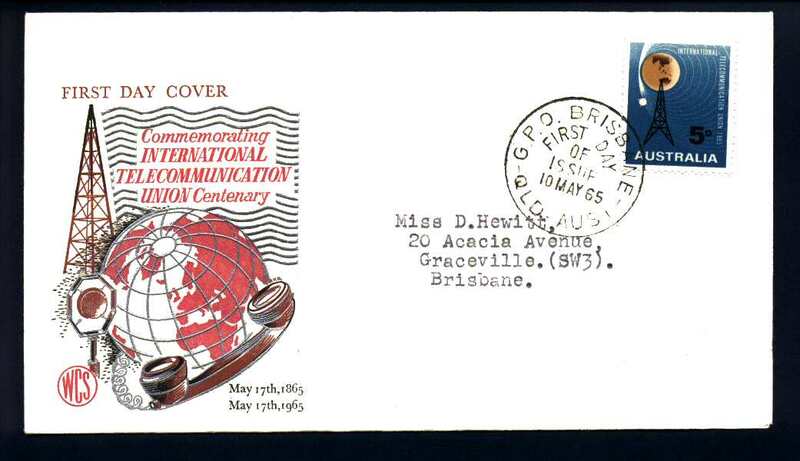 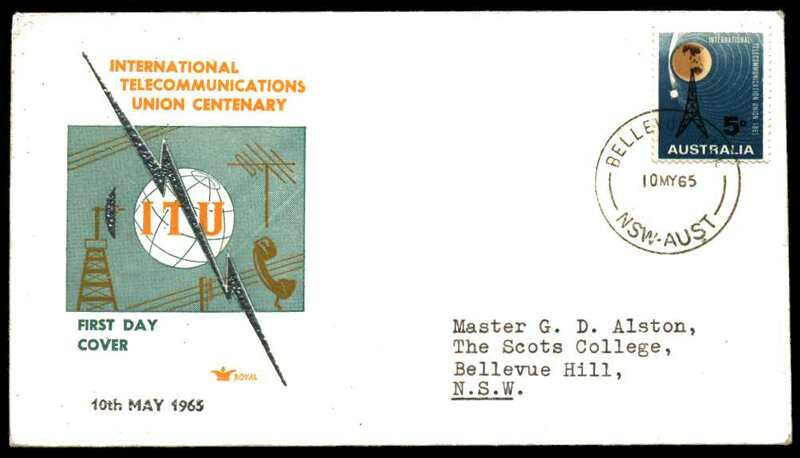 Australia Post only started issuing 'official' FDCs in March 1970. 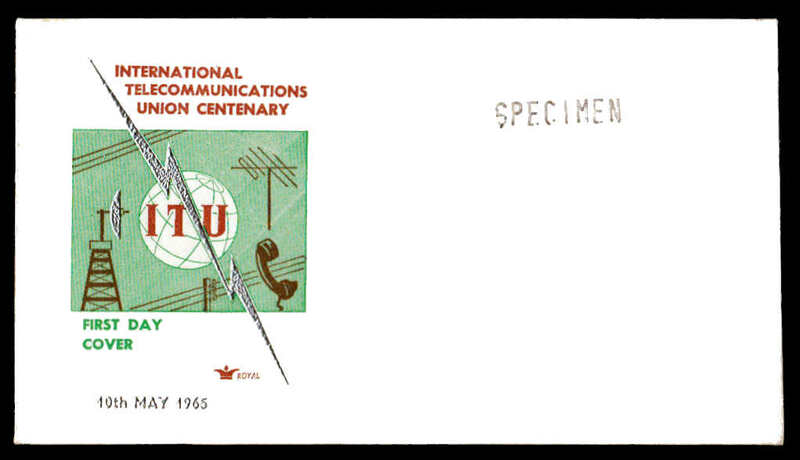 Before then, there were many private FDC producers. 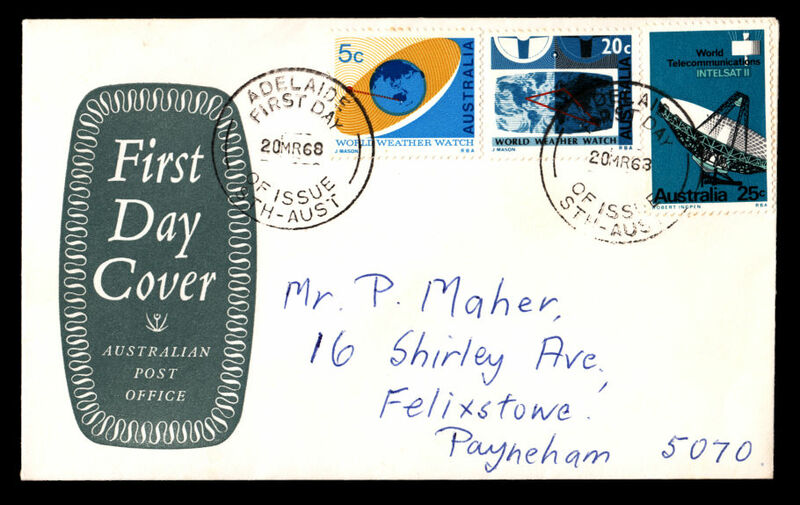 After Australia Post started issuing FDCs, most private producers dropped out. 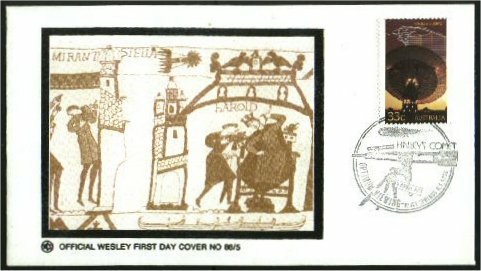 Benham Silk and Wesley covers are the only significant producers that survived. 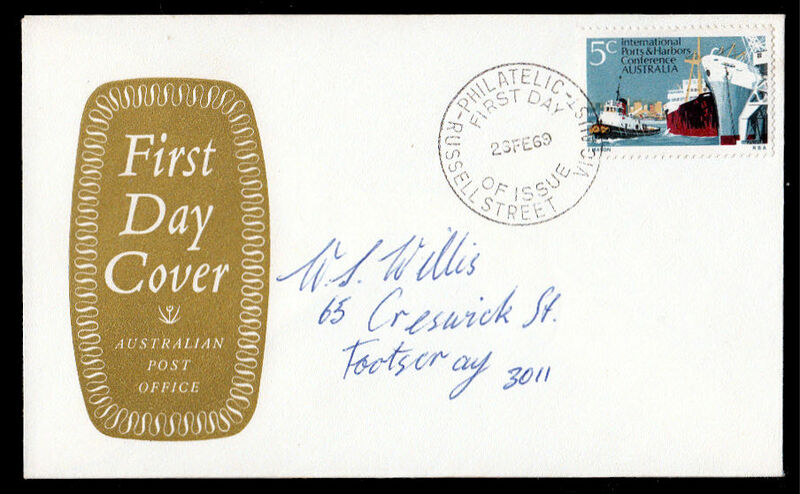 Predecimal FDCs are normally addressed as was required by the existing postal regulations. 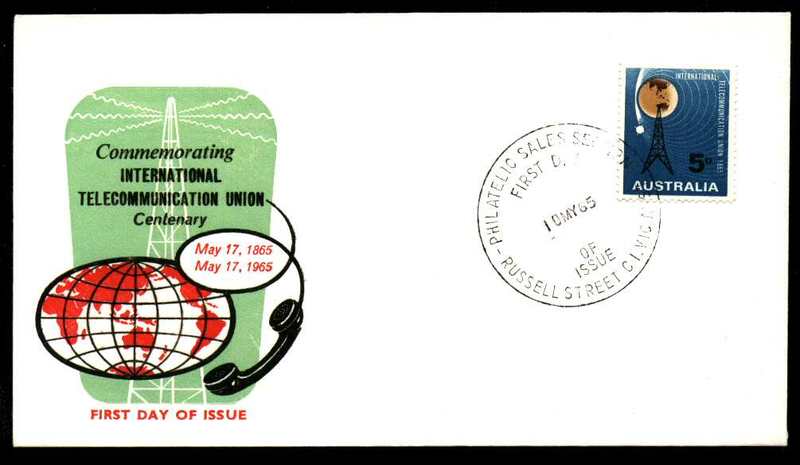 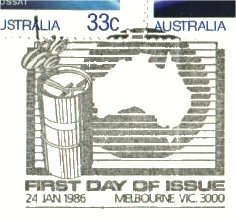 Complementary FDI postmarks were introduced in September 1985. 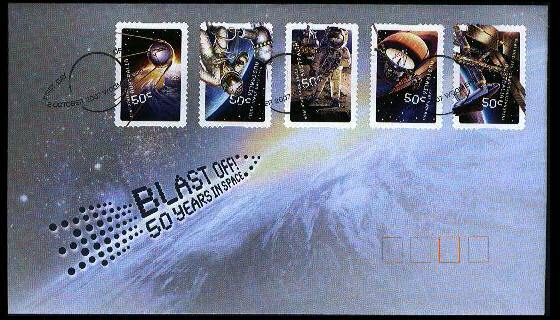 These are pictorial FDI postmarks designed for a specific stamp issue. 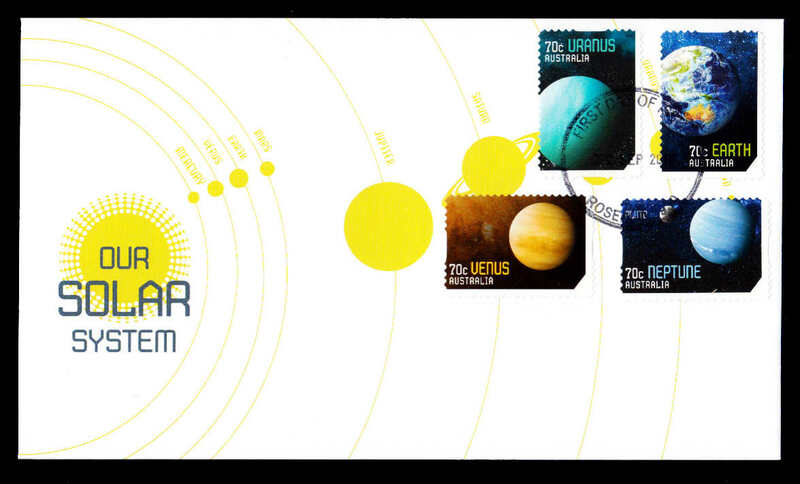 They are the forerunners of the National FDI Postmarks which were introduced in August 1987. 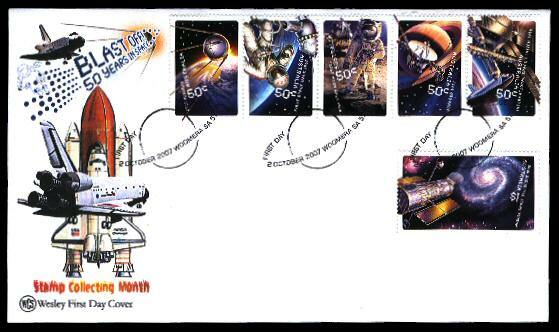 There are basicly five types of FDI postmarks. 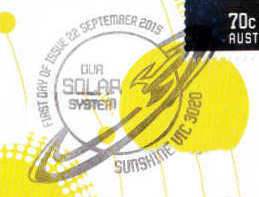 Note that not all are available for every stamp issue, especially earlier issues. 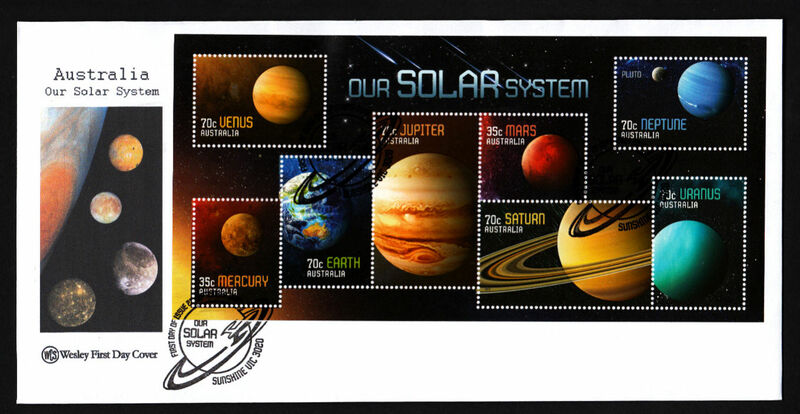 Only the first three types are documented in the table. 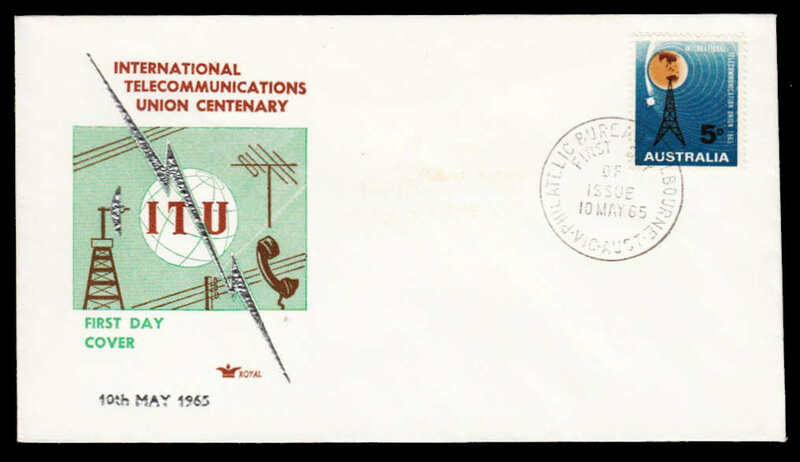 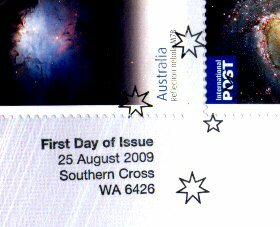 a) National FDI Postmark - this is the official Australia Post national postmark for the appropriate issue. 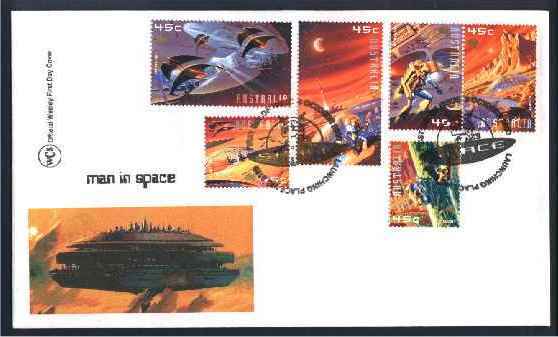 It is normally pictorial. 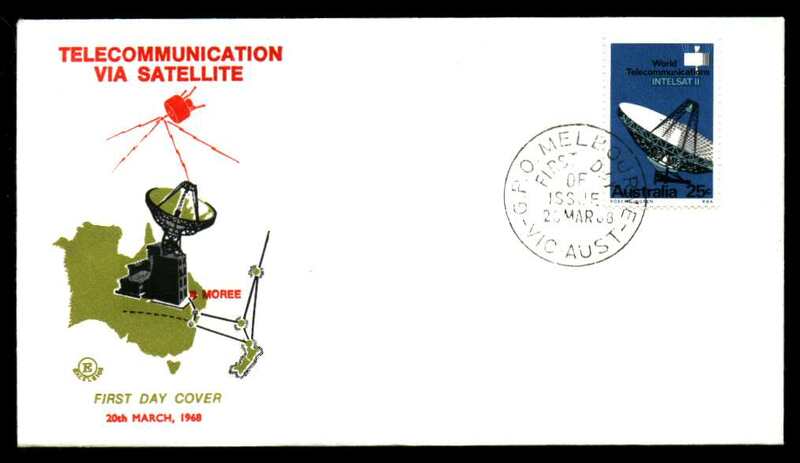 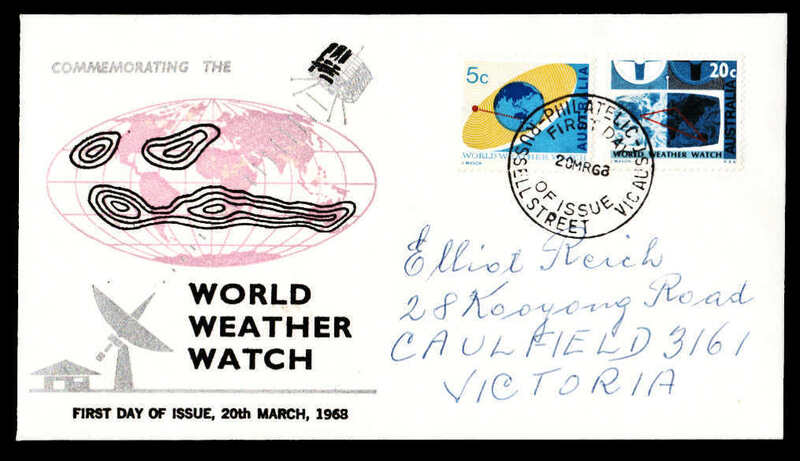 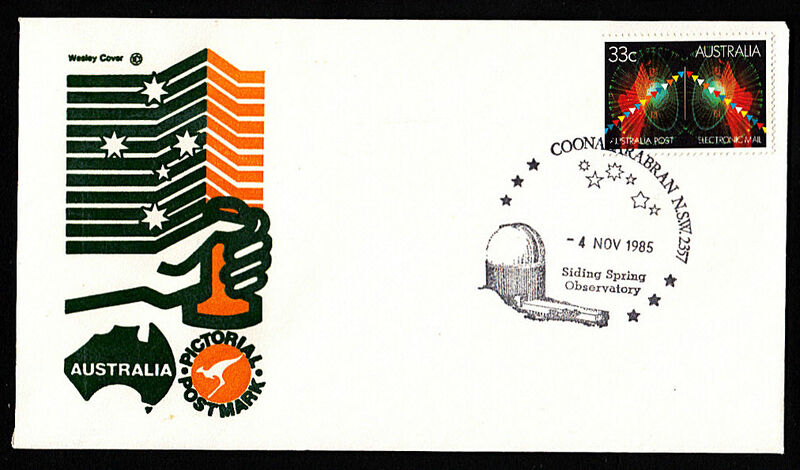 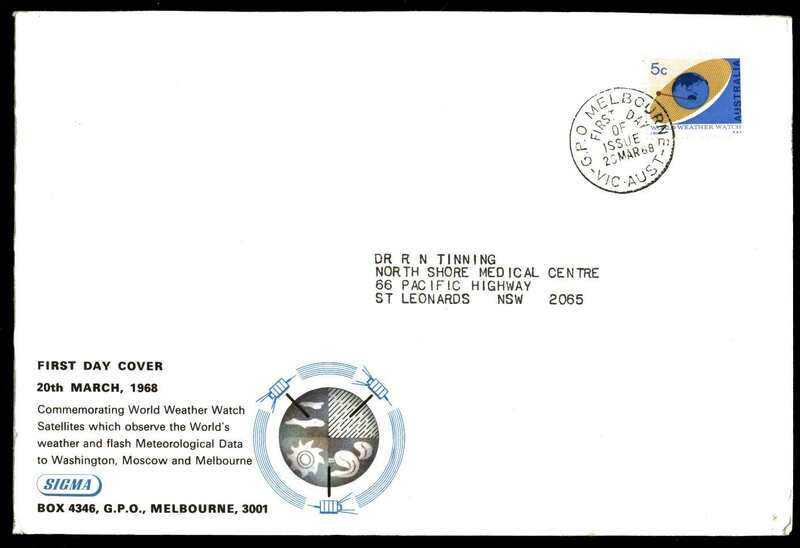 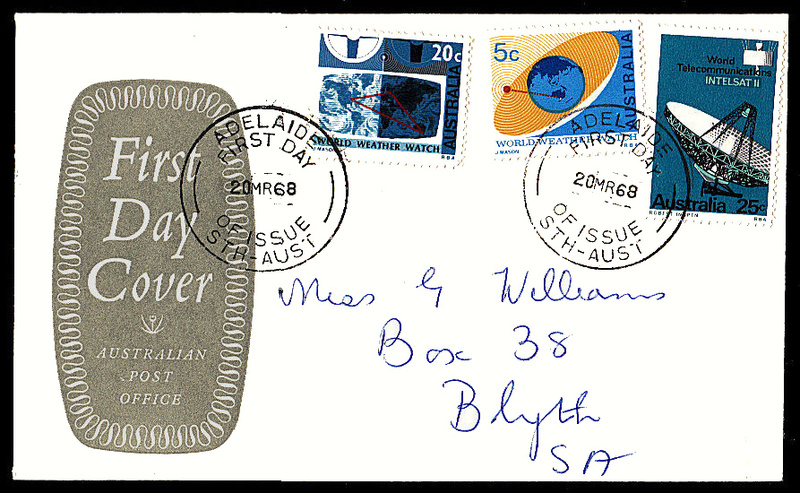 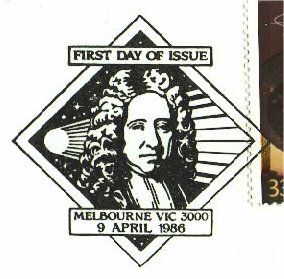 An example is the Melbourne Vic postmark for the Halley's Comet stamp. 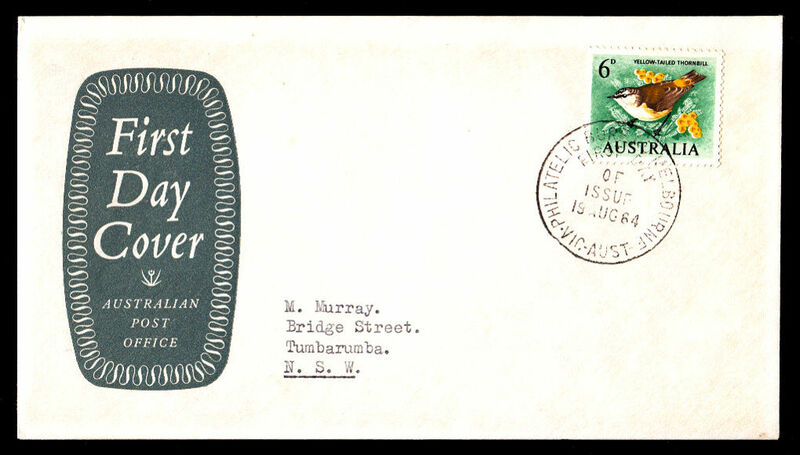 b) Special Pictorial Postmark - For many issues Australia Post issues temporary pictorial postmarks for towns with a special association with the subject depicted on the stamp. 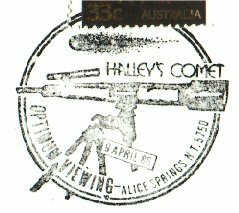 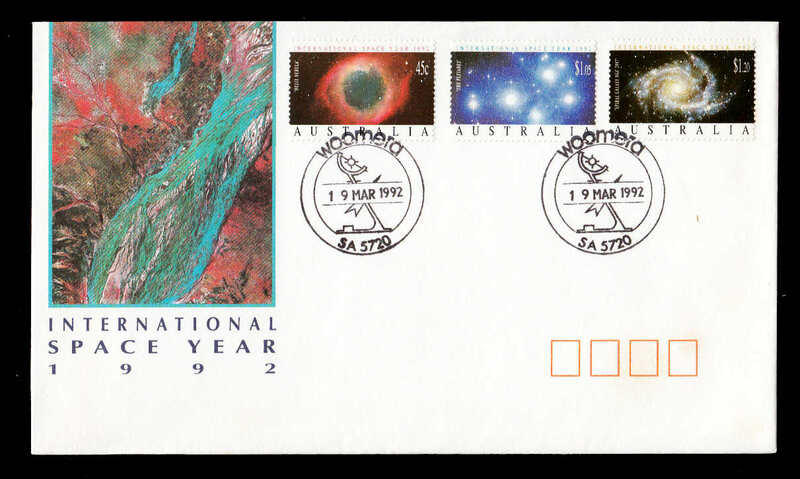 An example is the Alice Springs NT postmark for the Halley's Comet stamp. 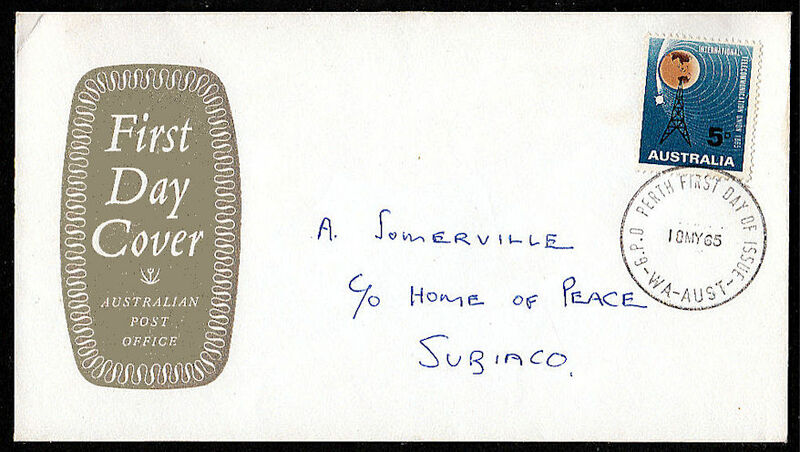 c) Normal Pictorial Postmark - For some stamp issues the normal pictorial postmark for a particular town may have special relevance. 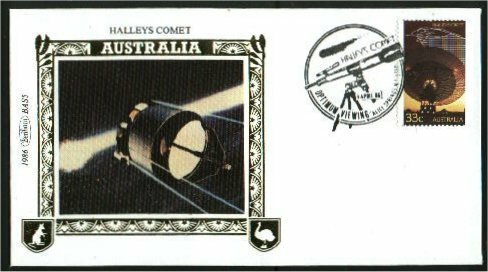 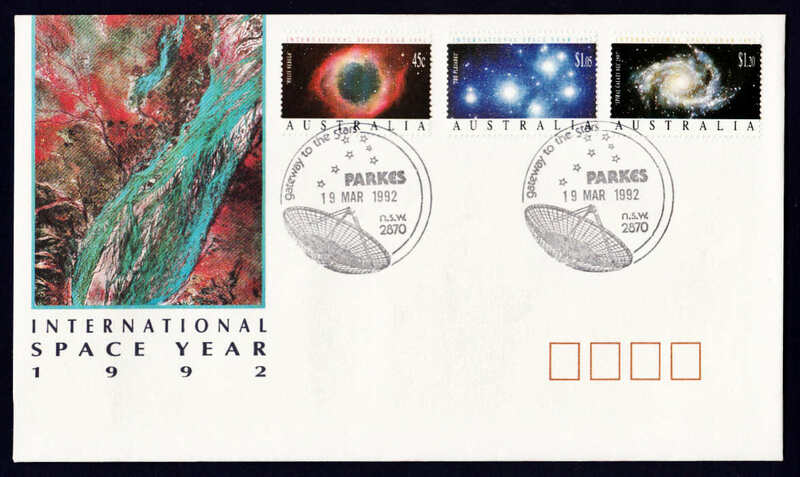 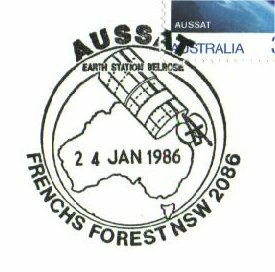 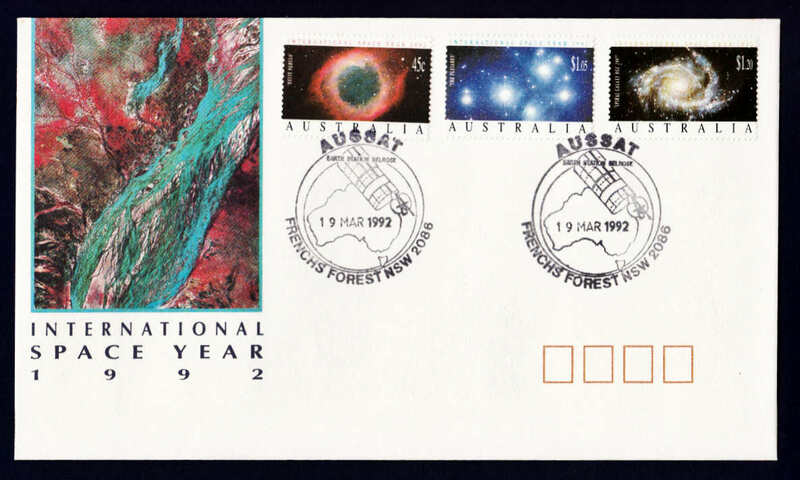 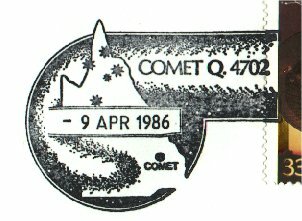 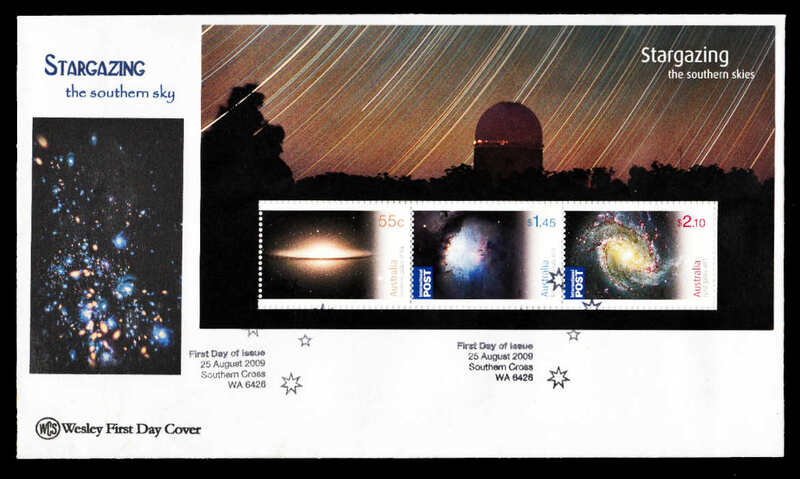 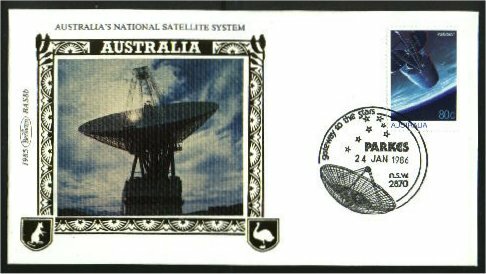 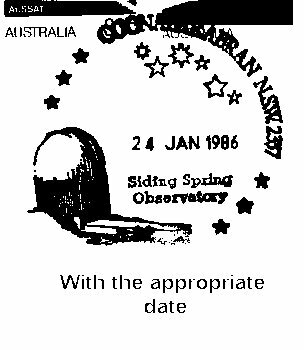 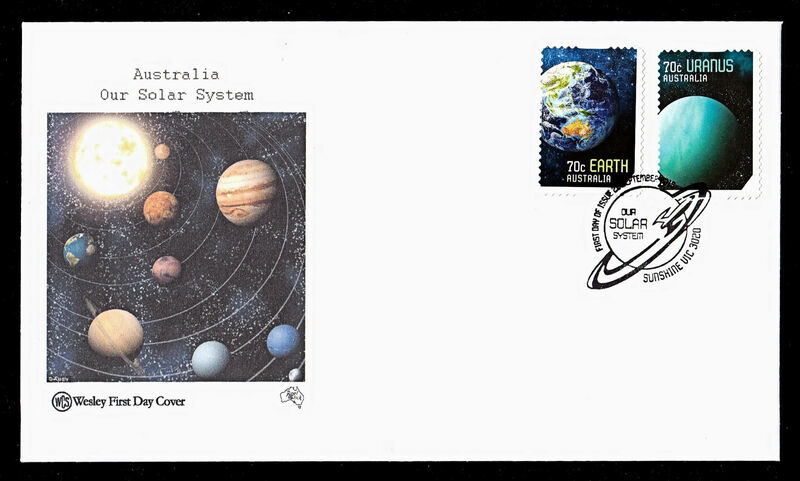 An example is the Parks NSW postmark for the Halley's Comet stamp. 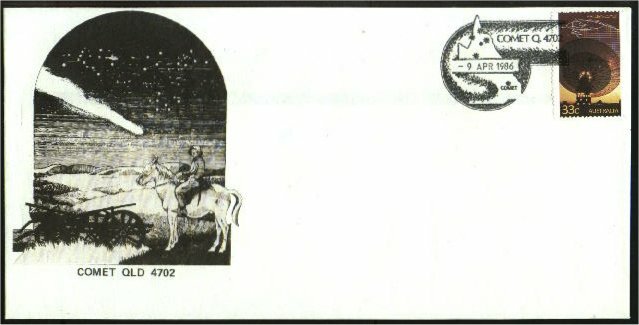 d) Normal FDI Postmark - Most (if not all) Post Offices have a normal FDI postmark which is usually non-pictorial. 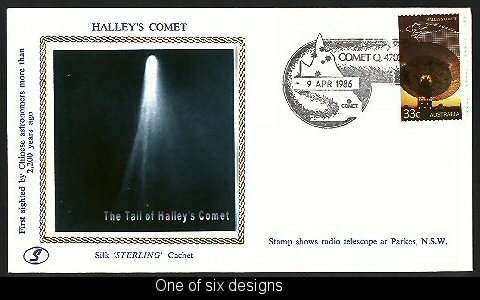 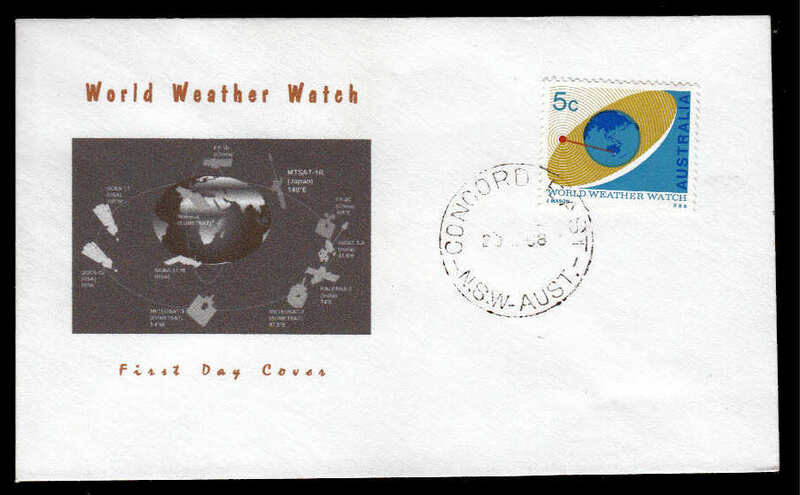 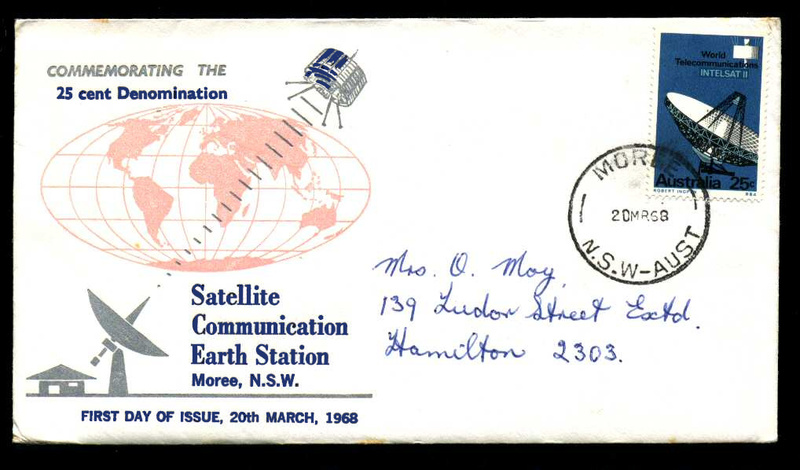 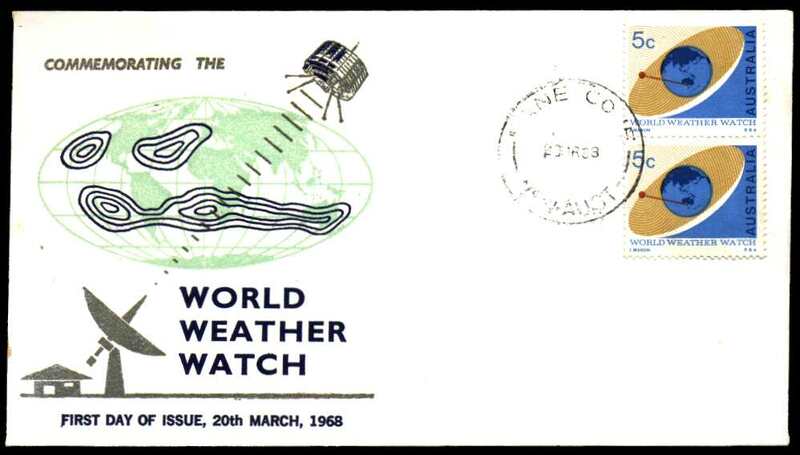 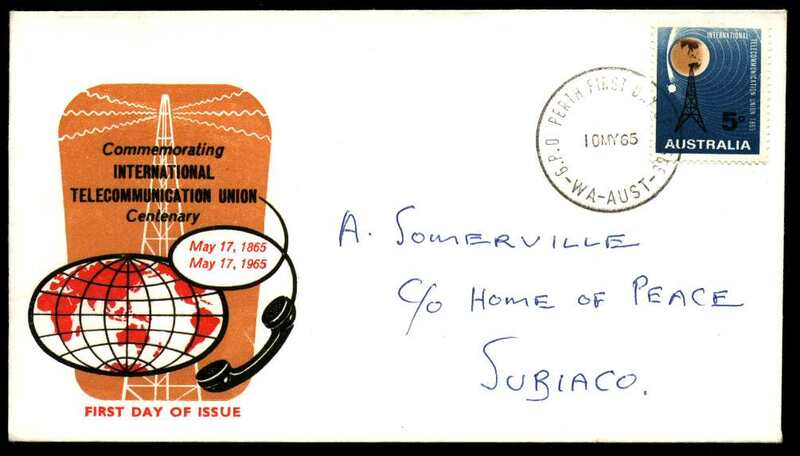 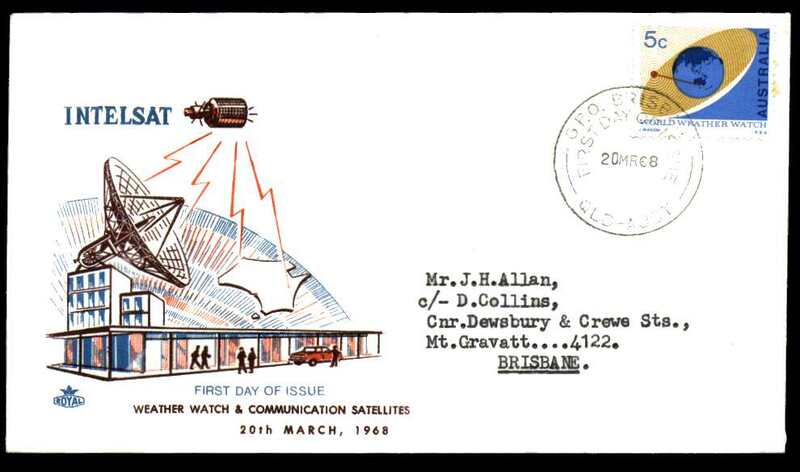 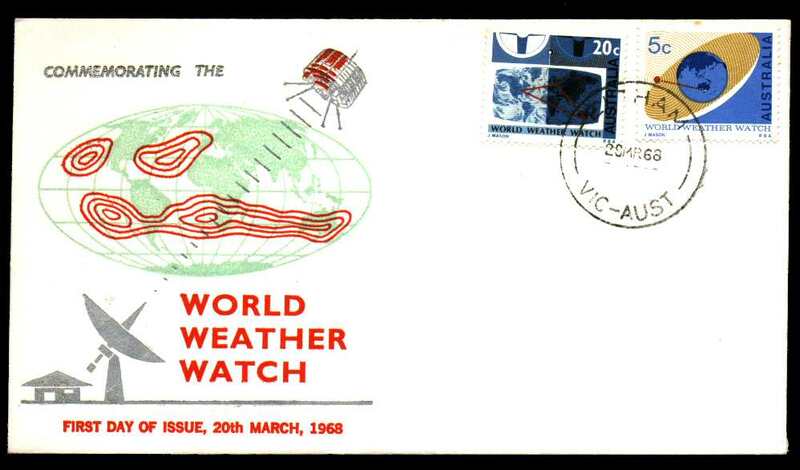 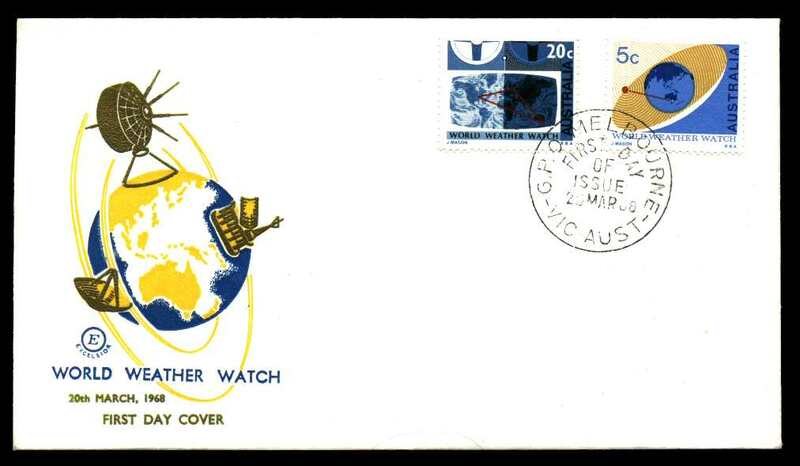 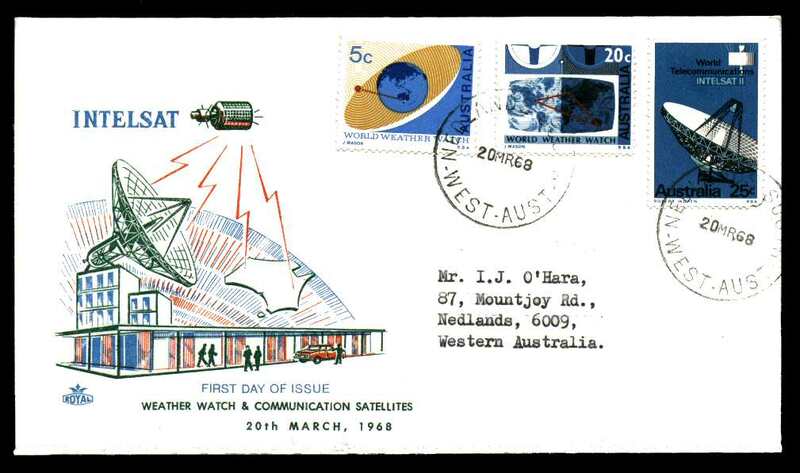 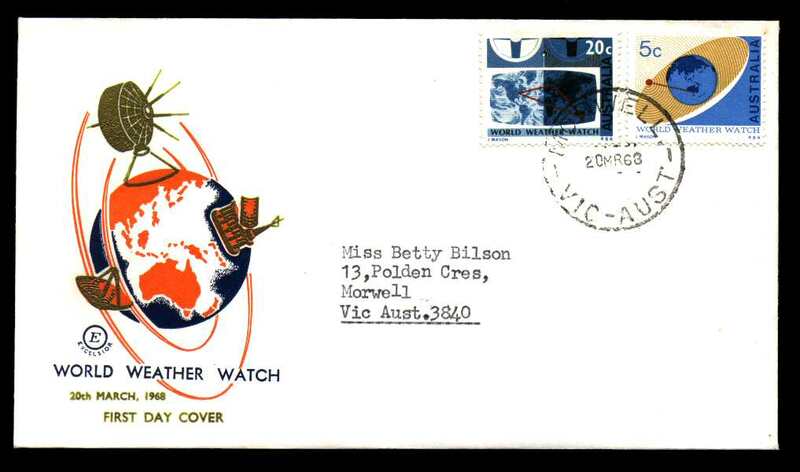 An example is the Sydney Philatelic Sales Centre NSW postmark or the Woden ACT postmark for the Halley's Comet stamp. 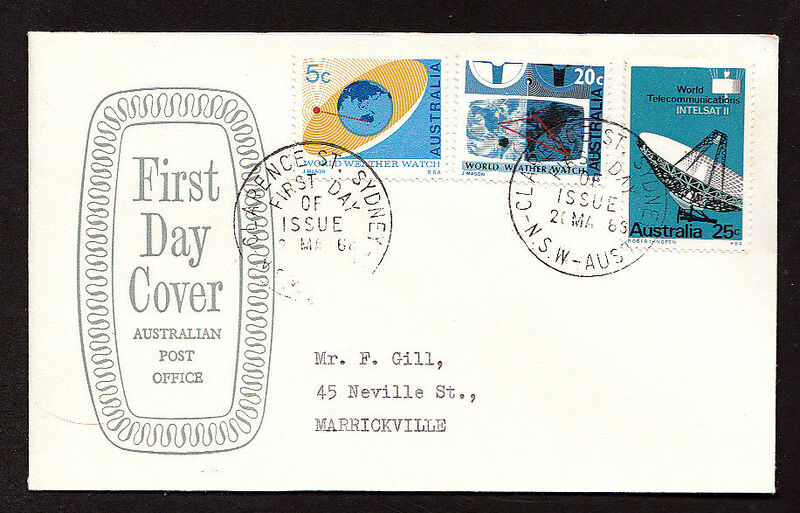 e) Normal Postmark - A cover with a Post Office's normal postmark dated on the correct day would be considered a FDC. 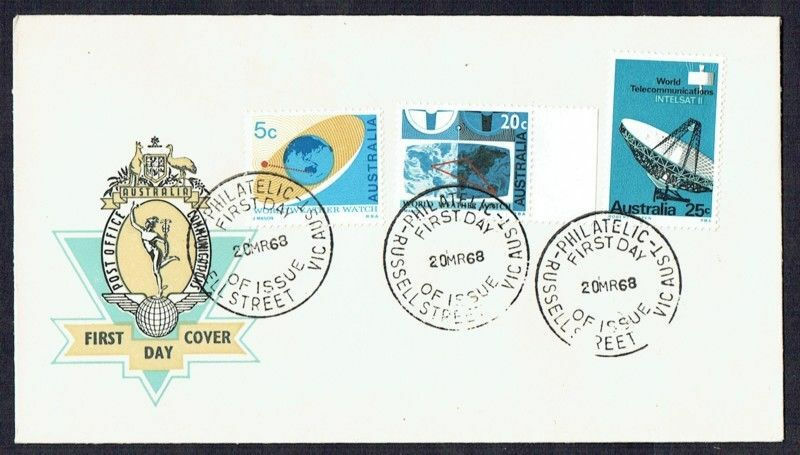 These are most common on pre-decimal FDCs. 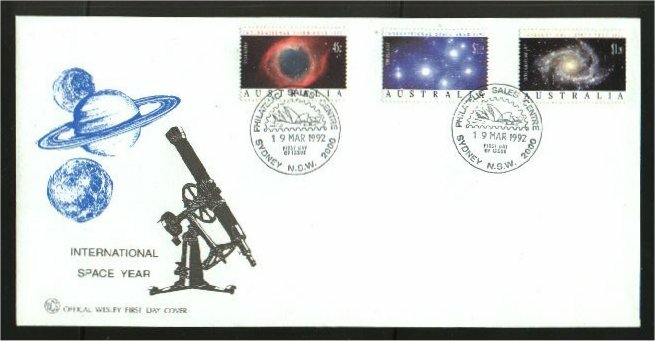 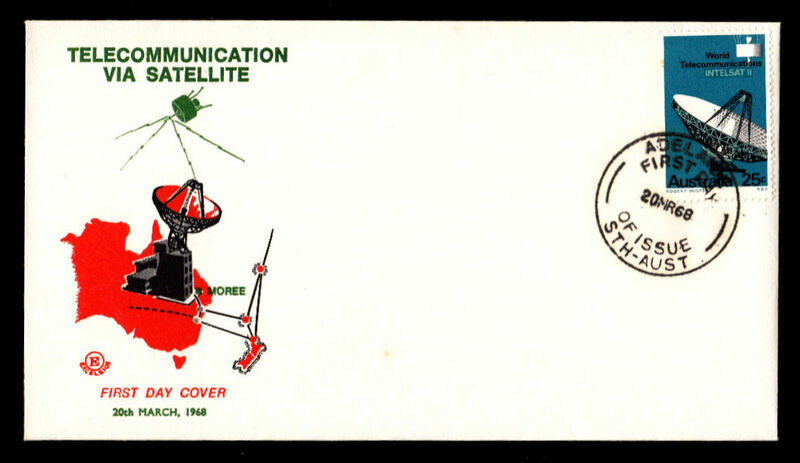 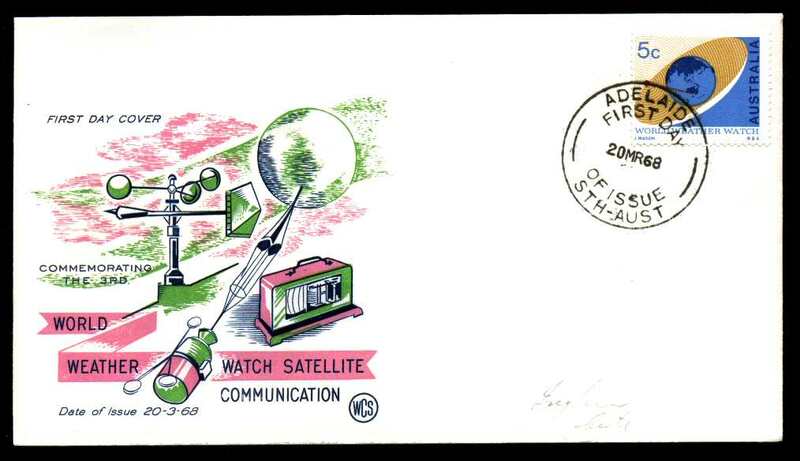 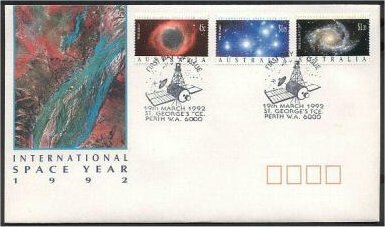 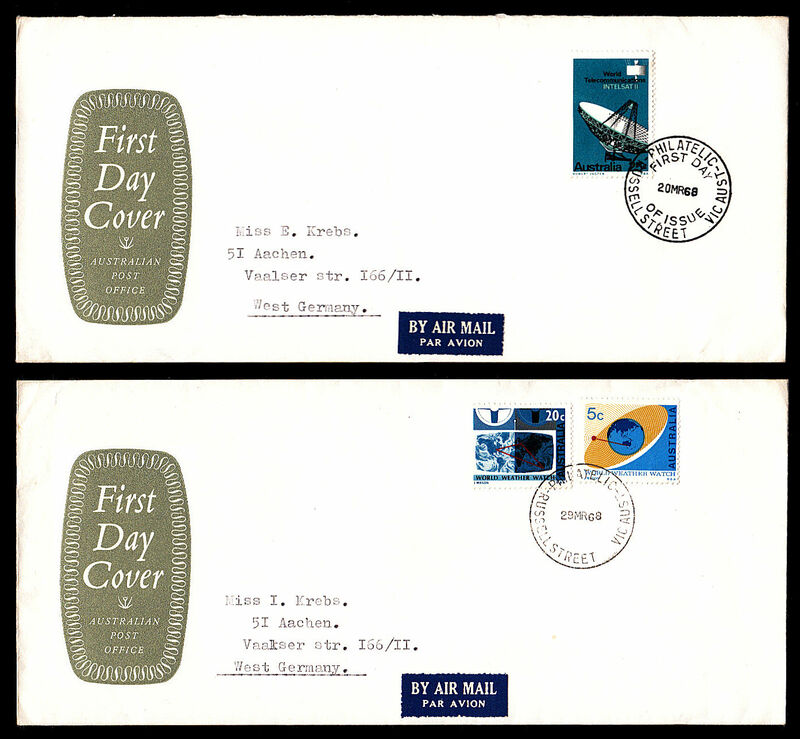 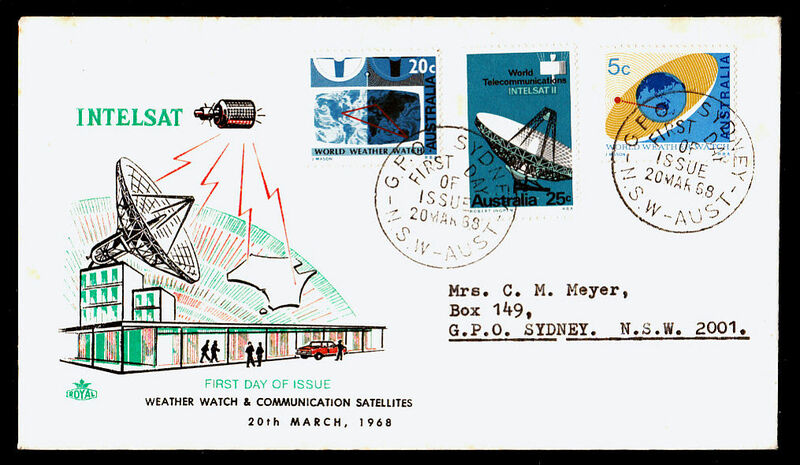 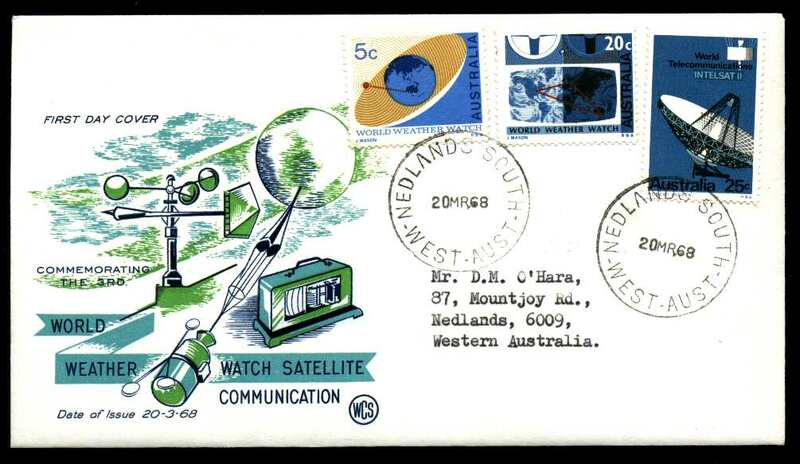 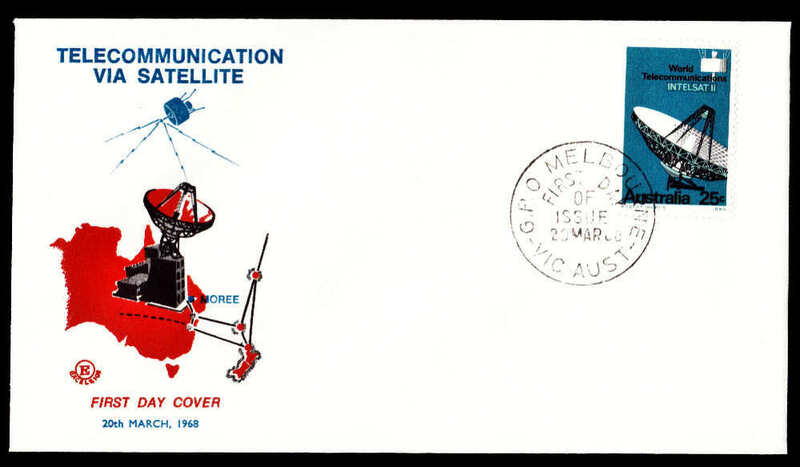 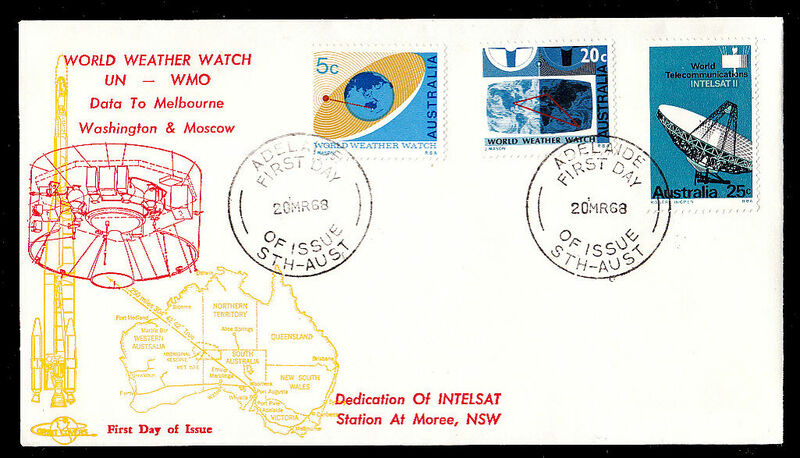 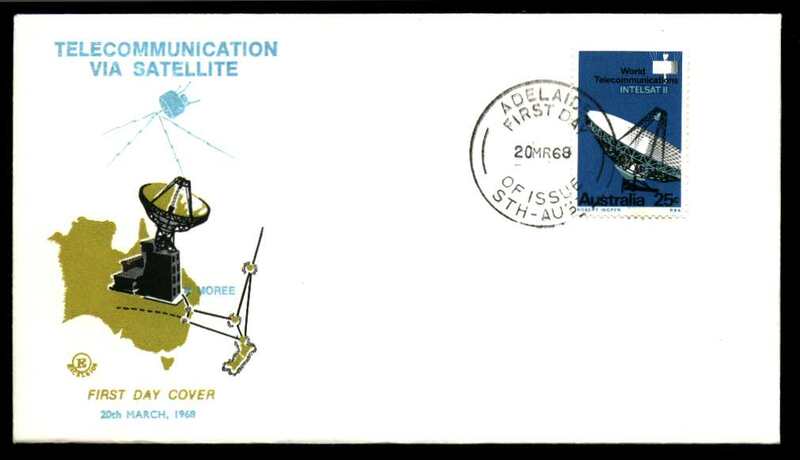 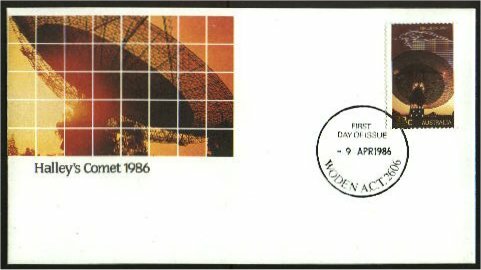 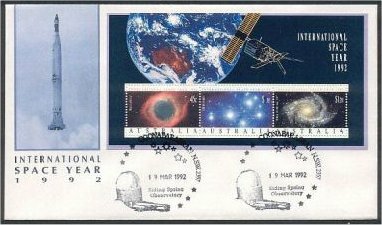 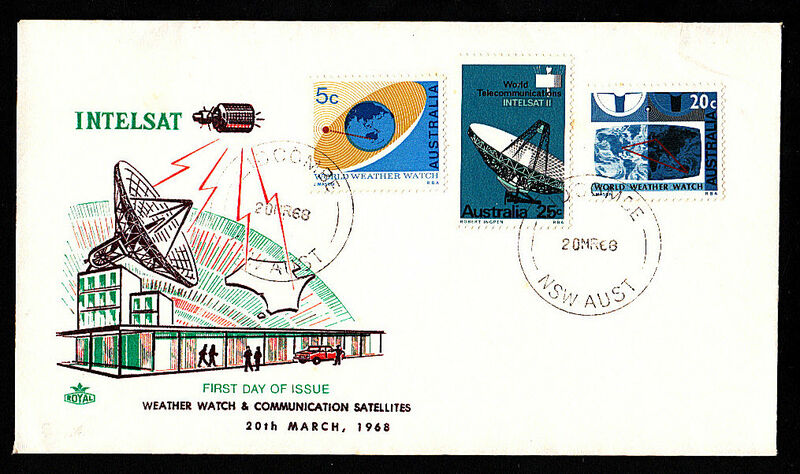 Wesley FDC 4 identical covers in different colours show the symbols of the four scientific developments including the Radio Telescope and Oceanography (satellite). 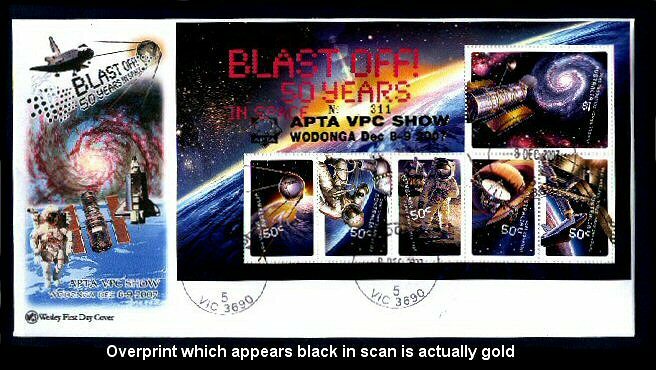 The colours are yellow & brown; green & brown; yellow & red and green & red. 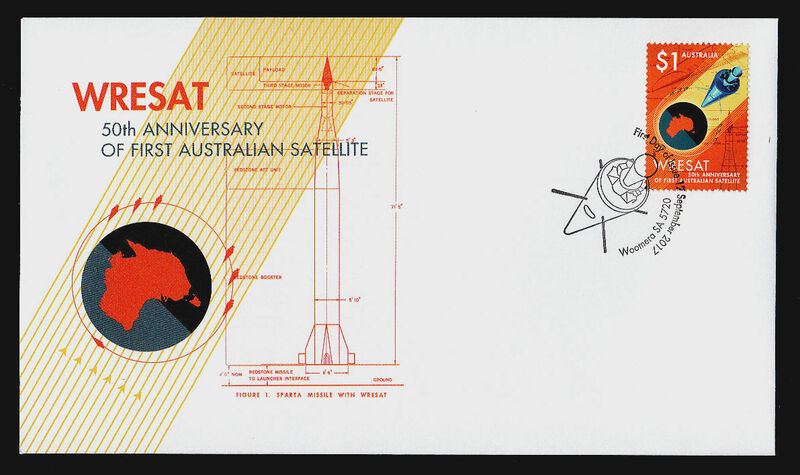 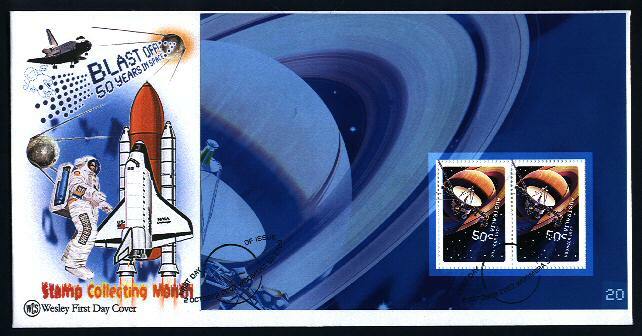 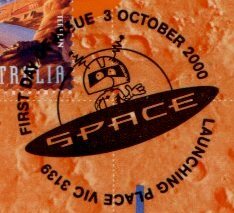 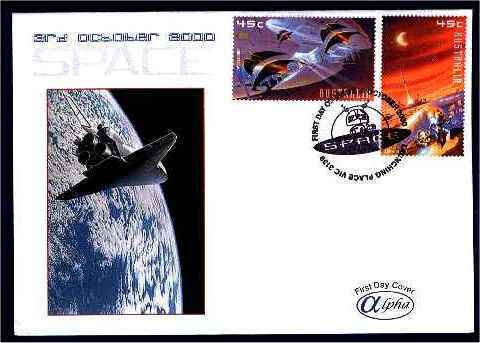 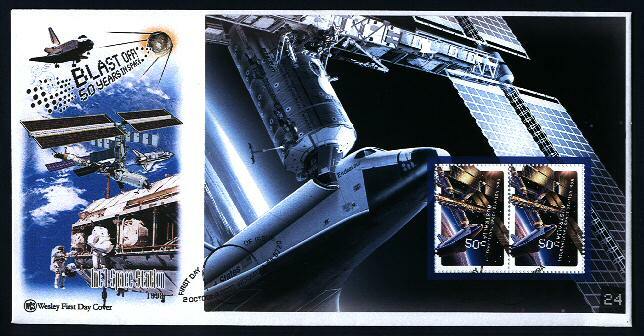 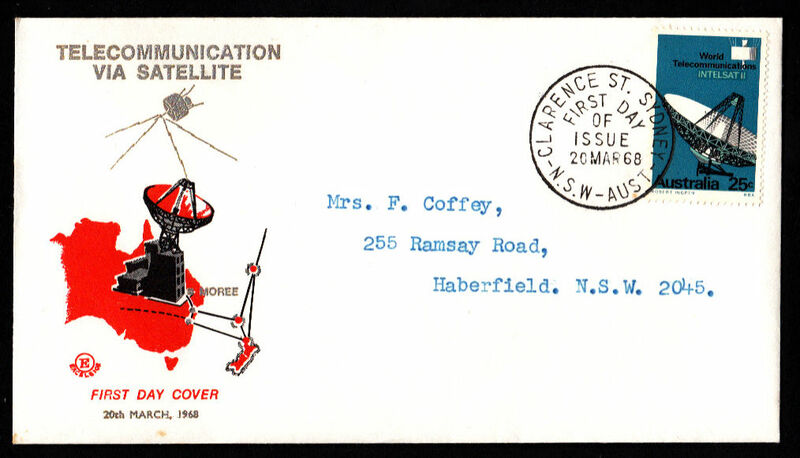 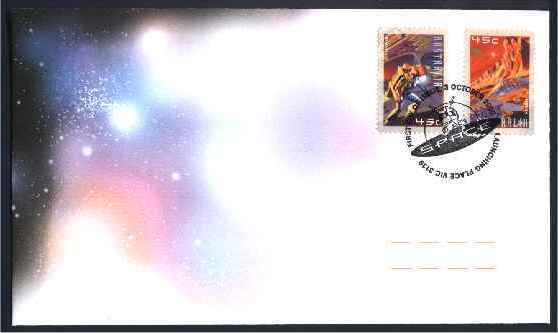 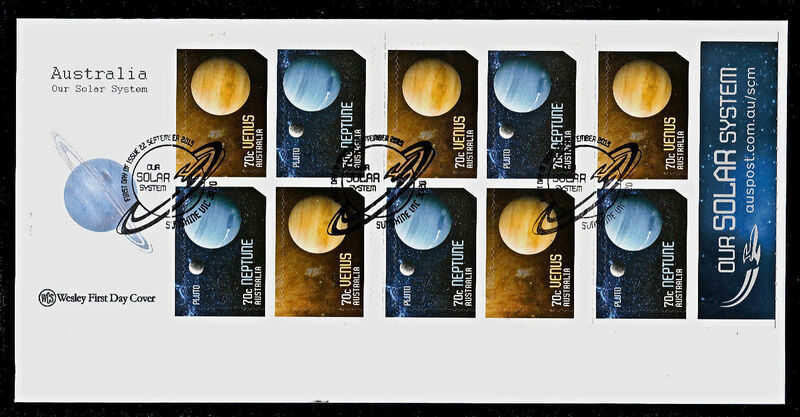 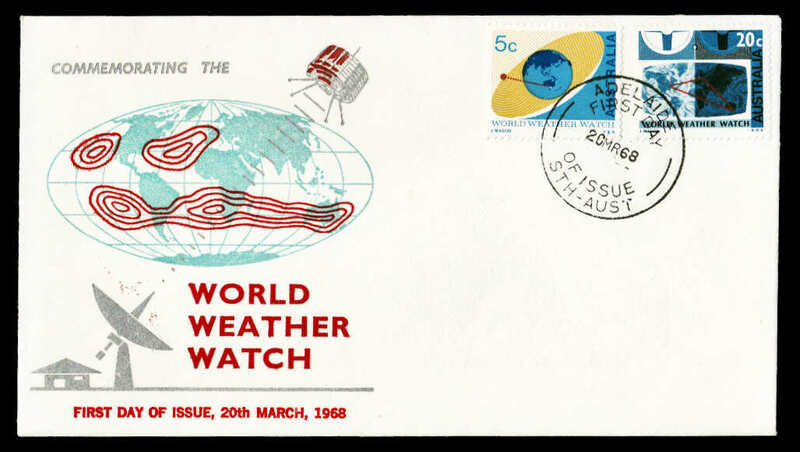 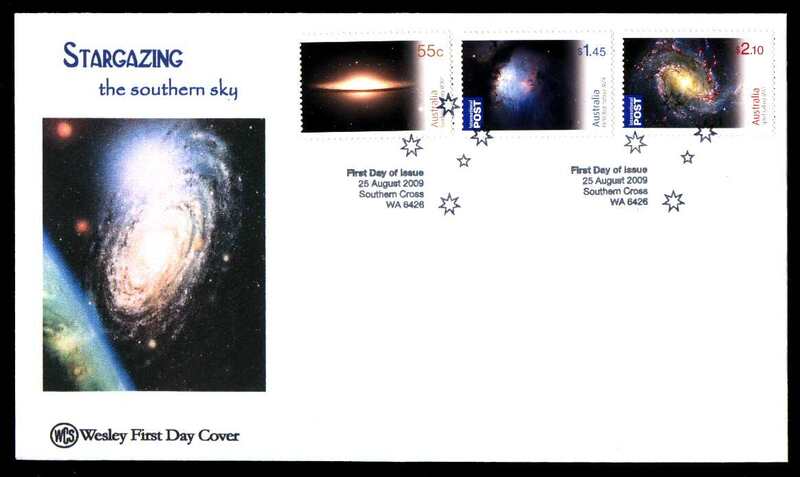 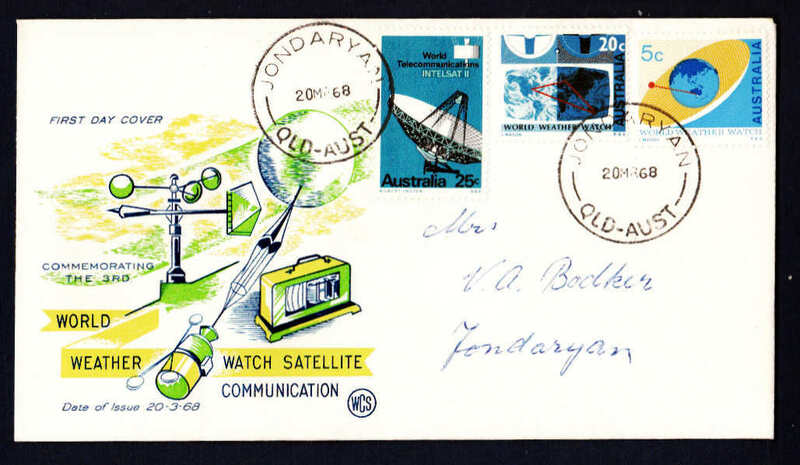 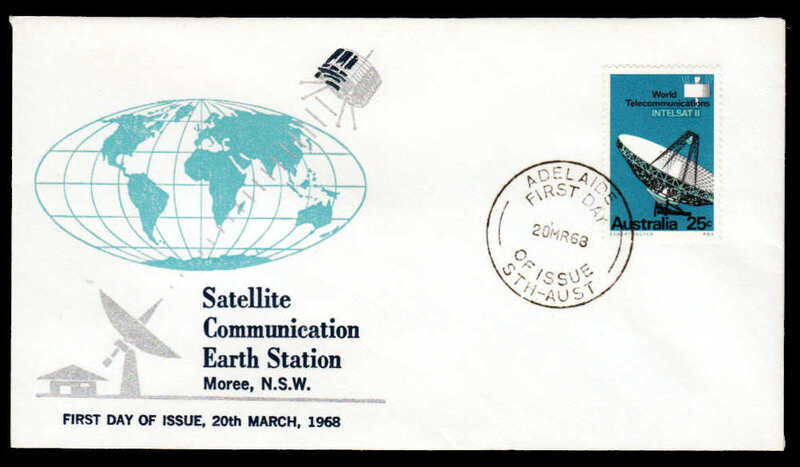 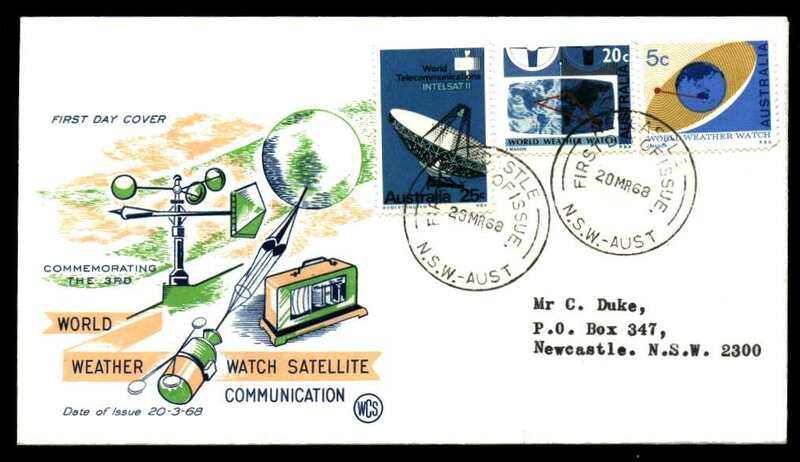 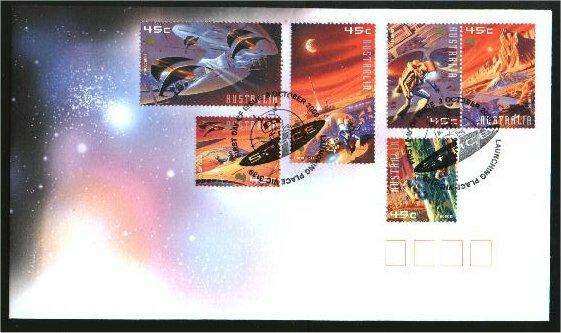 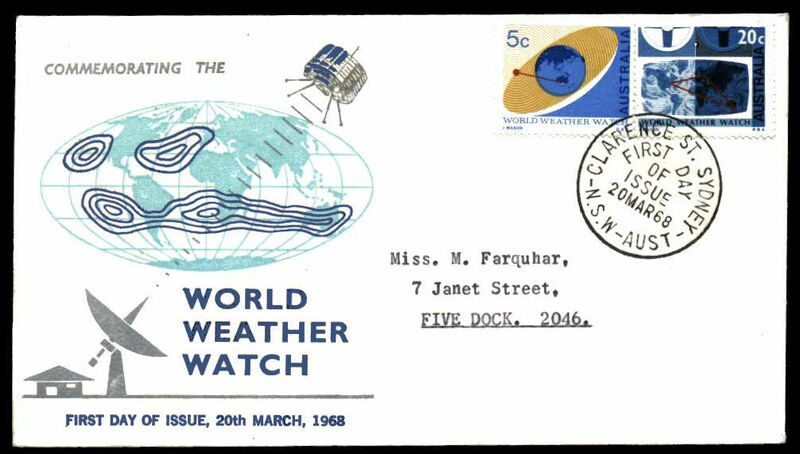 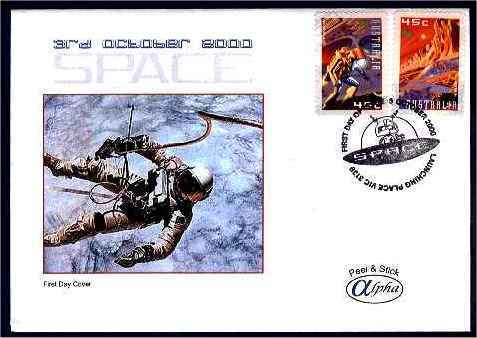 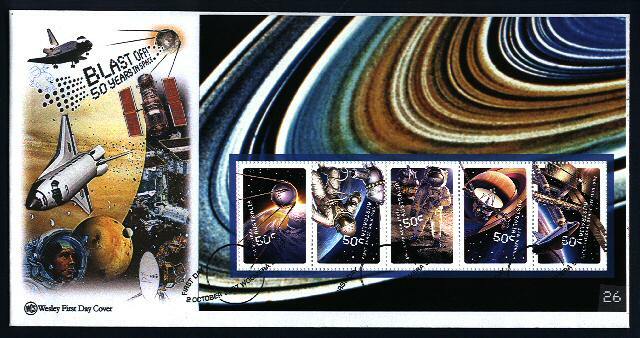 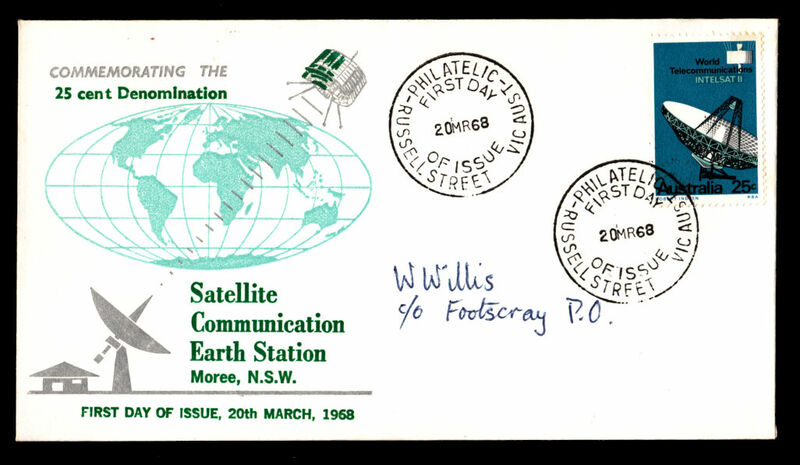 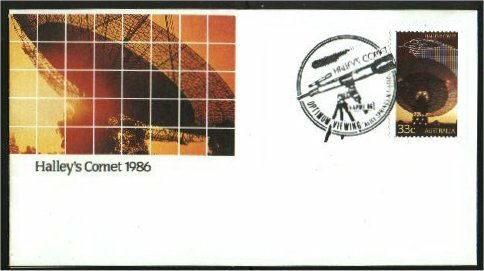 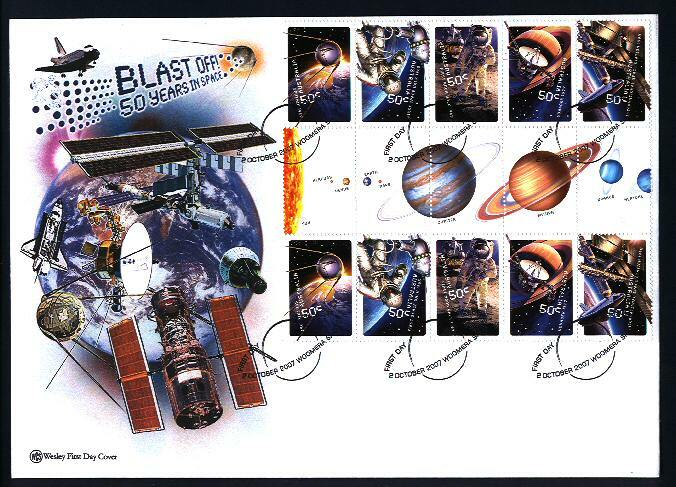 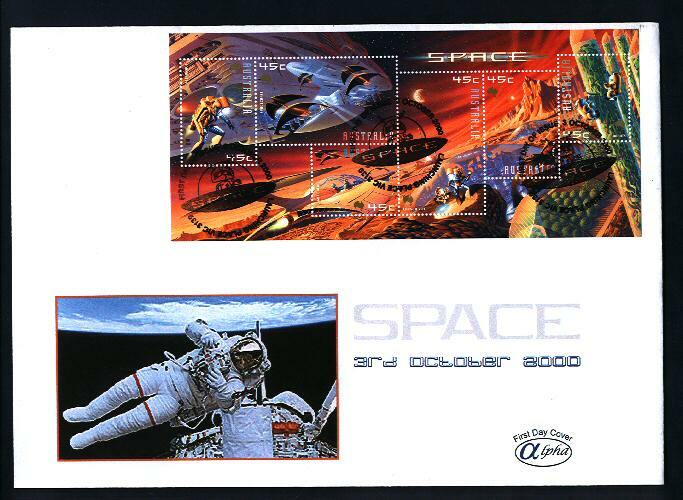 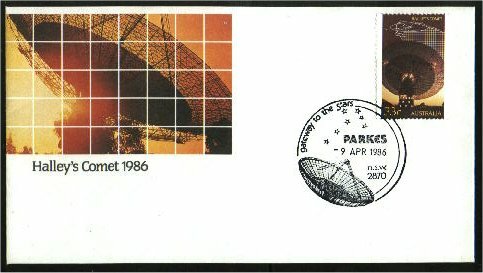 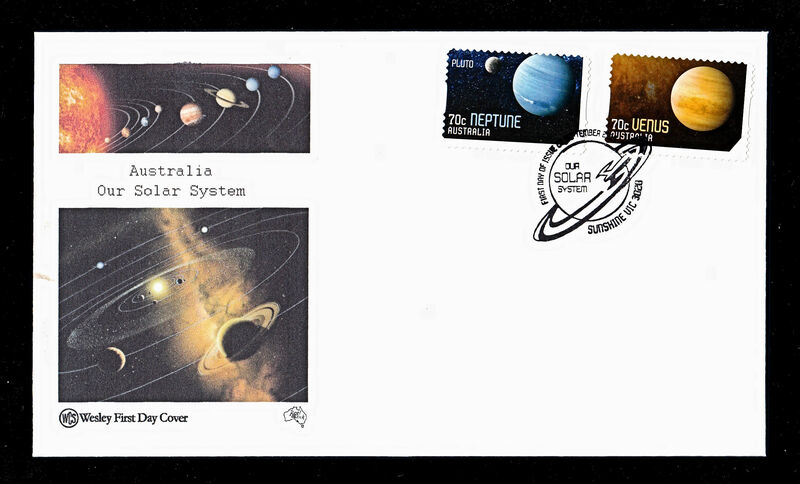 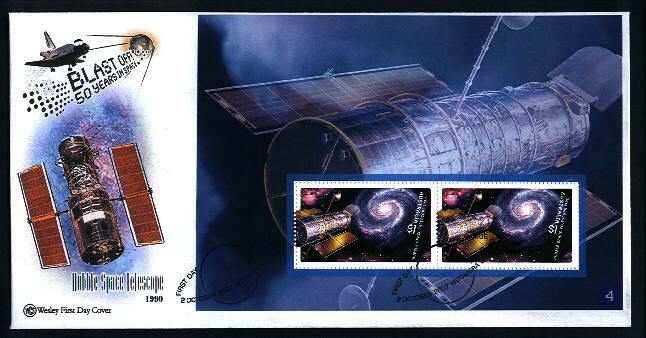 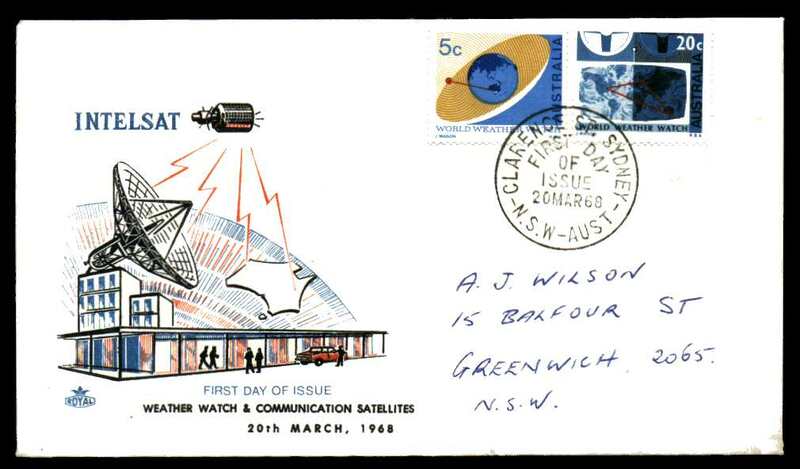 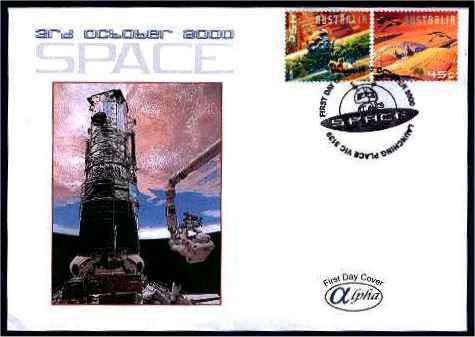 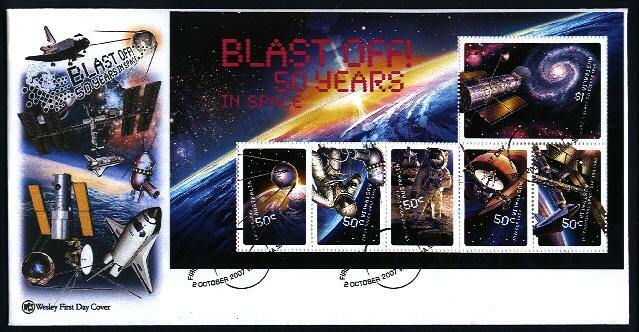 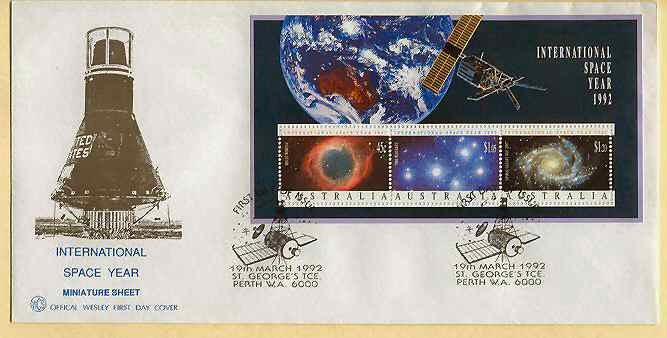 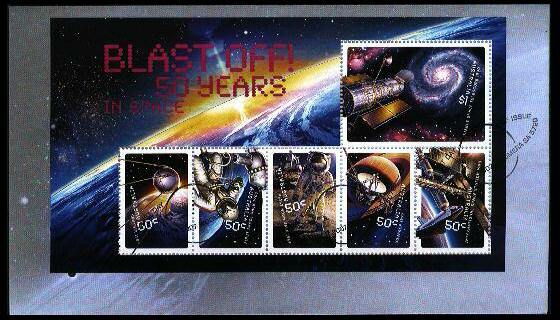 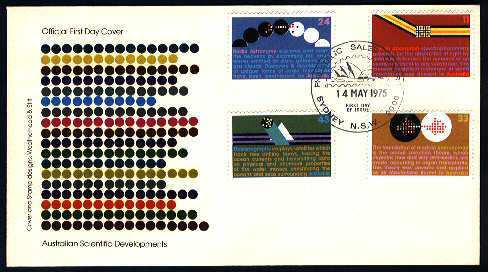 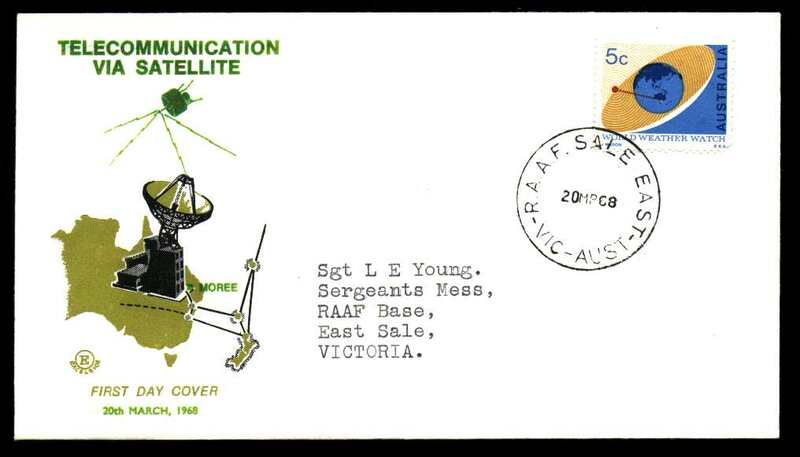 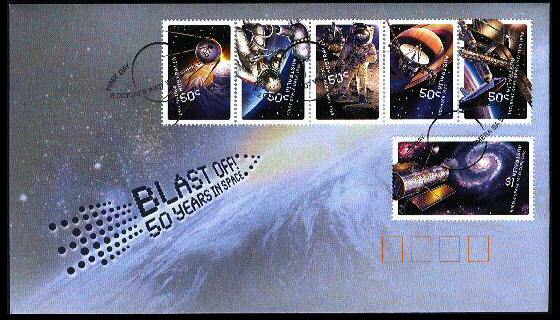 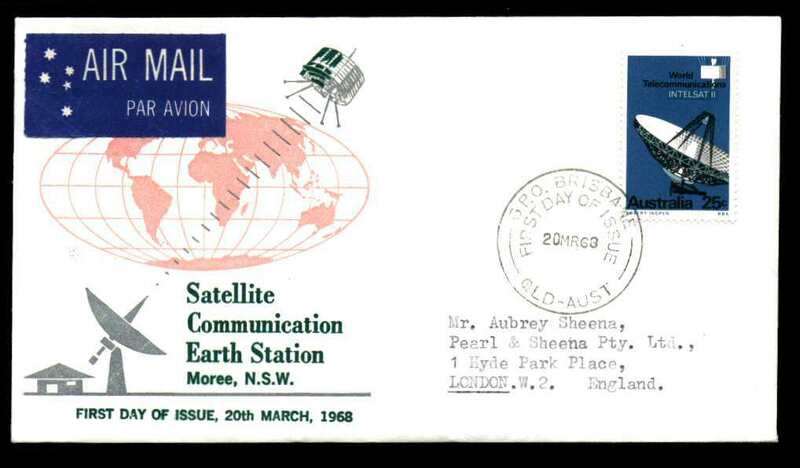 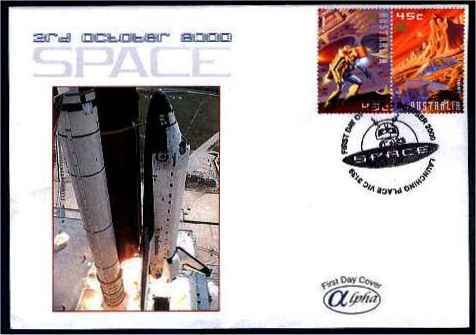 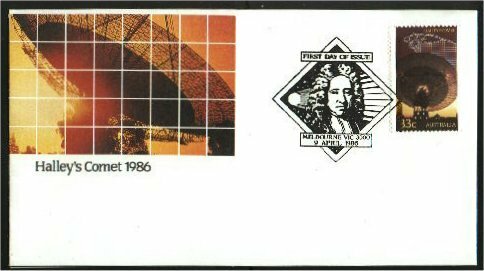 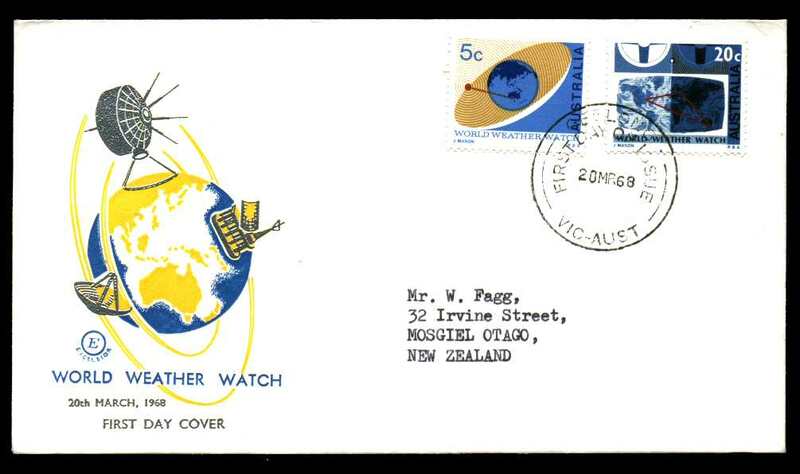 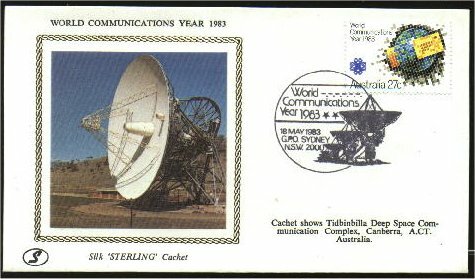 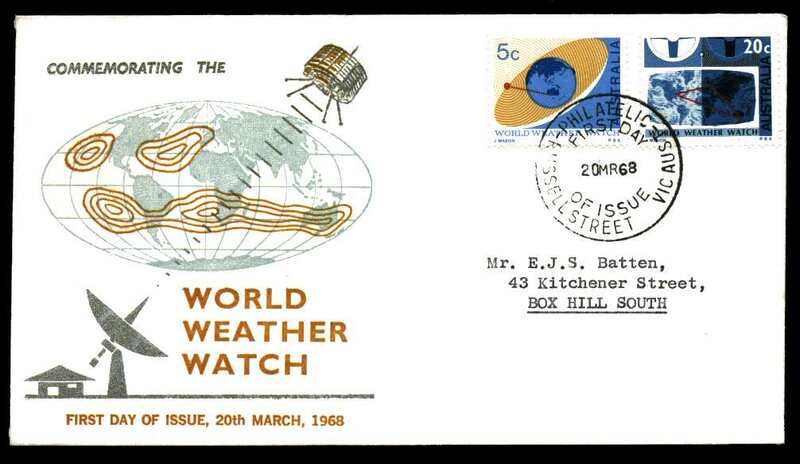 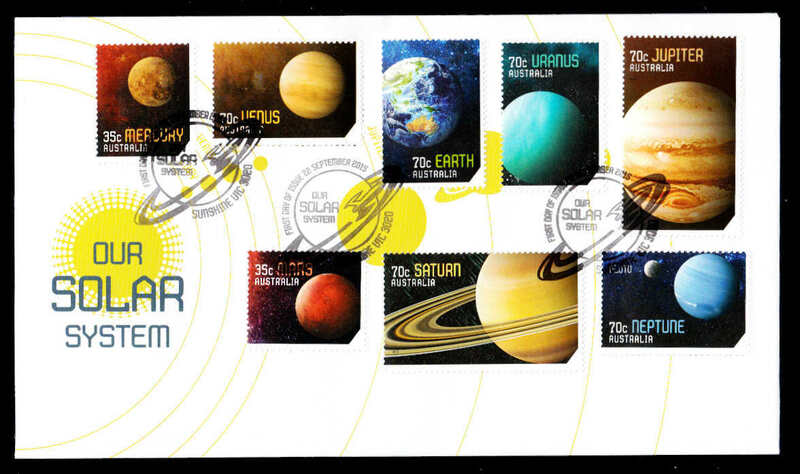 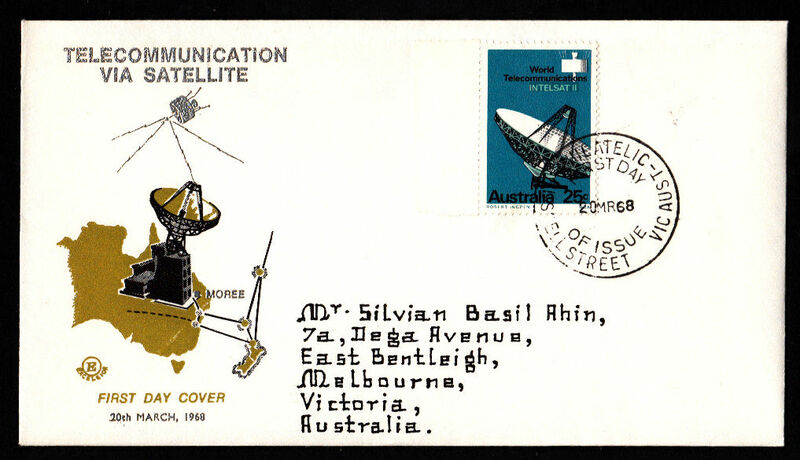 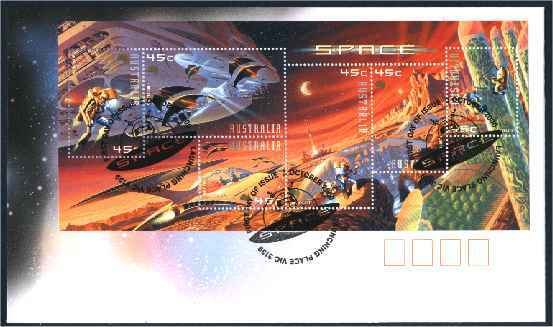 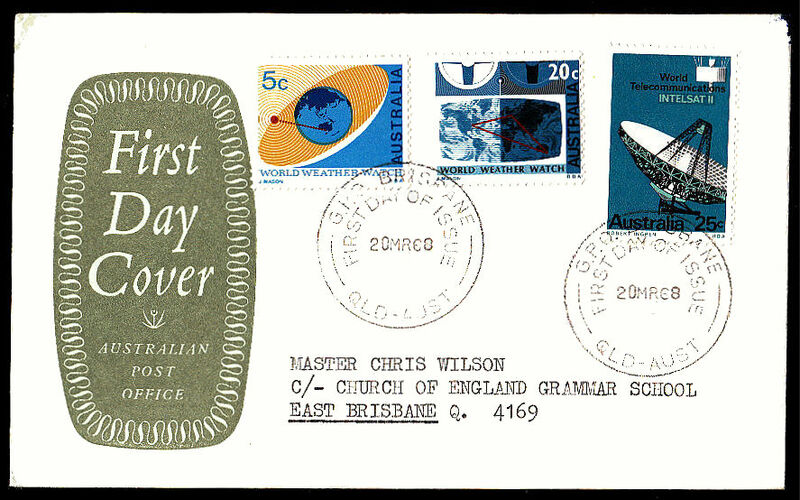 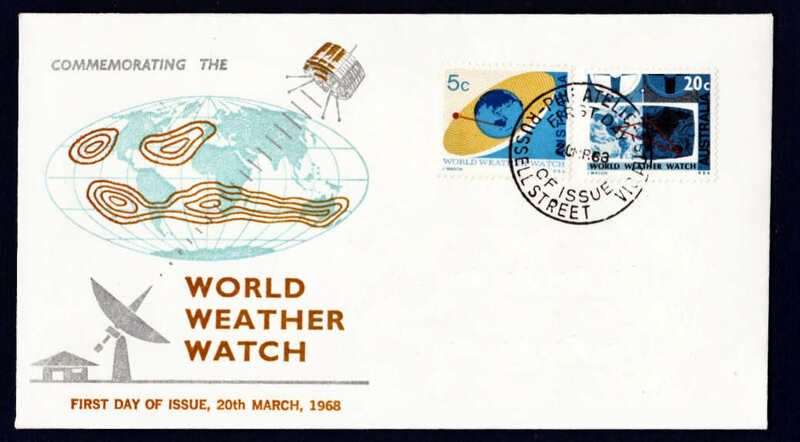 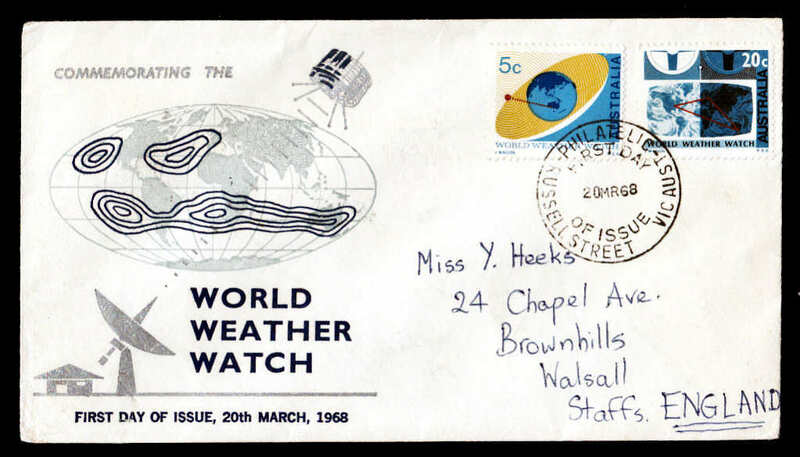 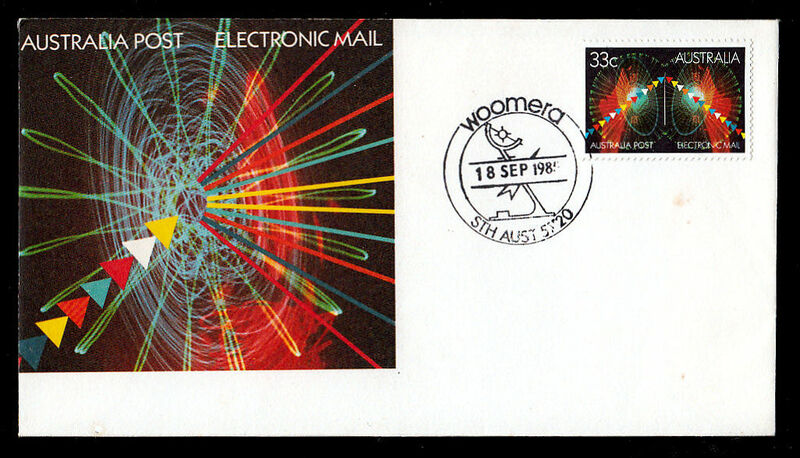 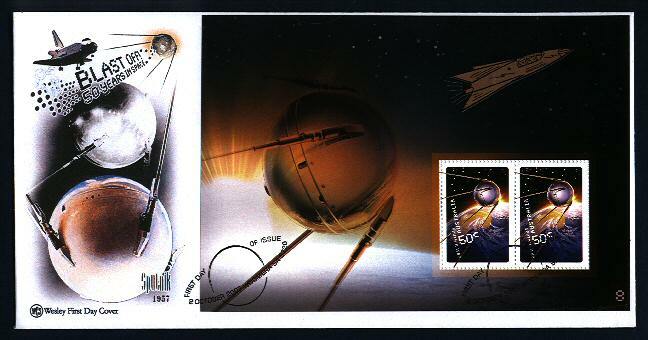 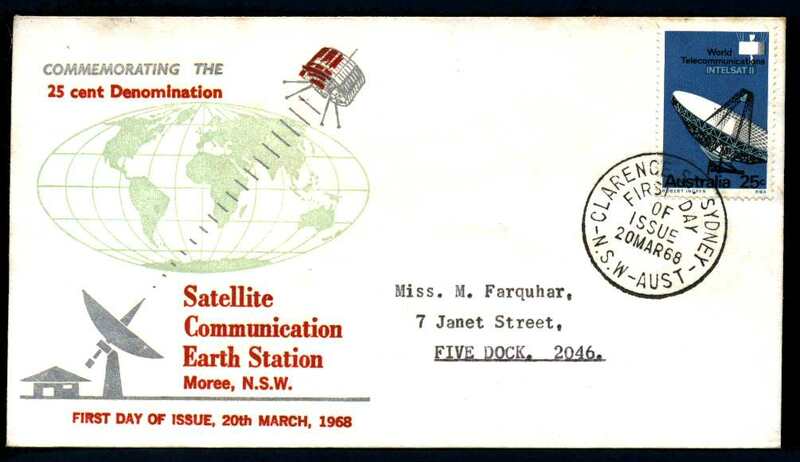 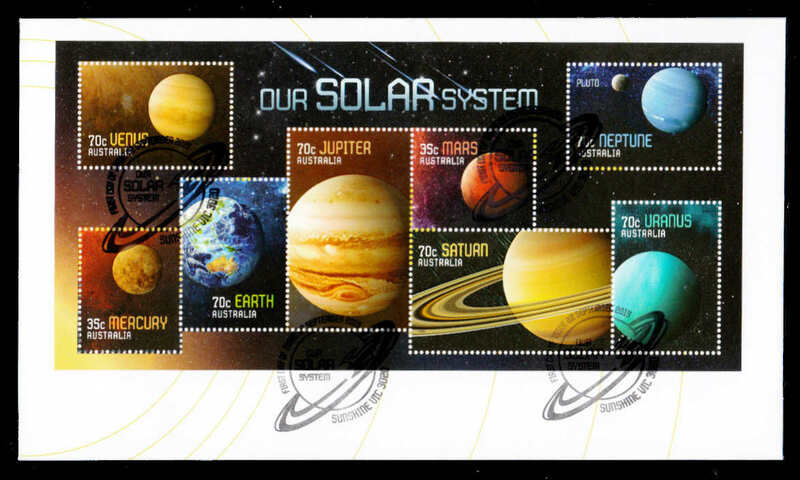 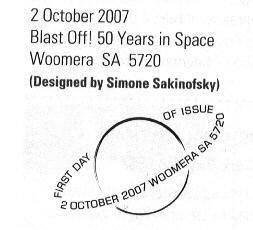 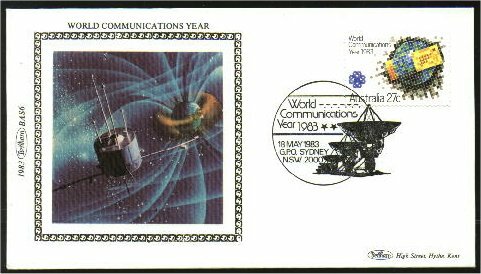 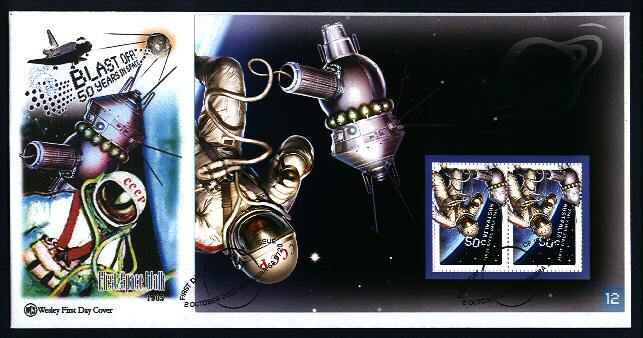 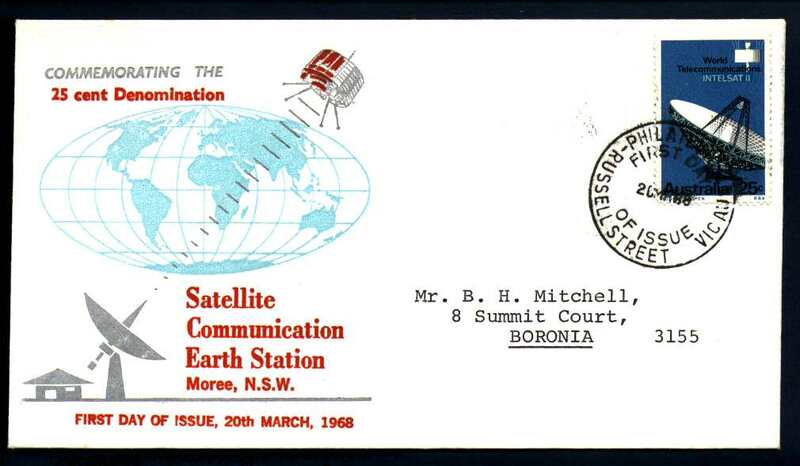 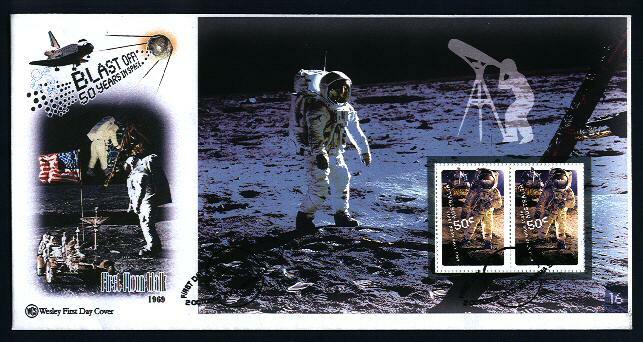 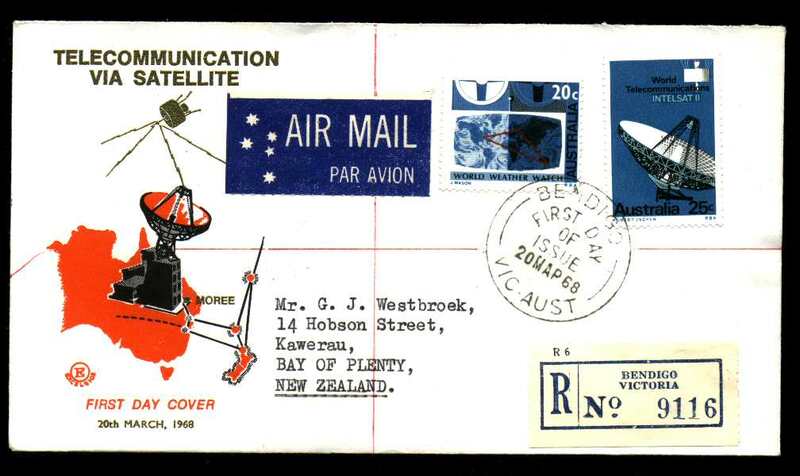 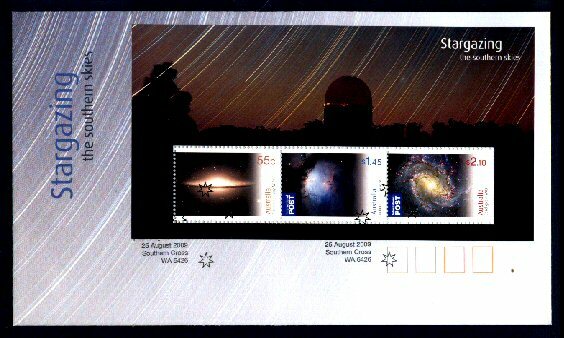 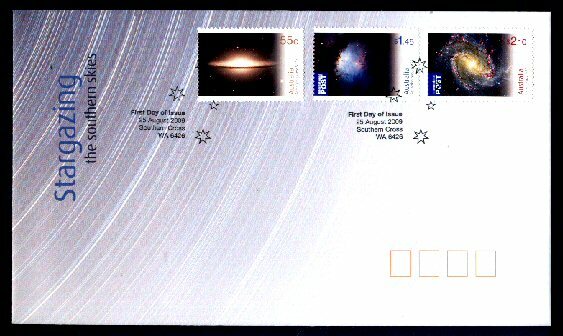 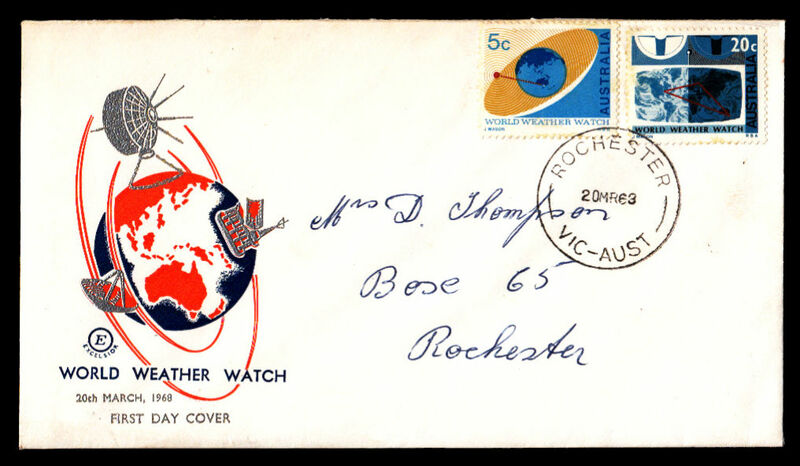 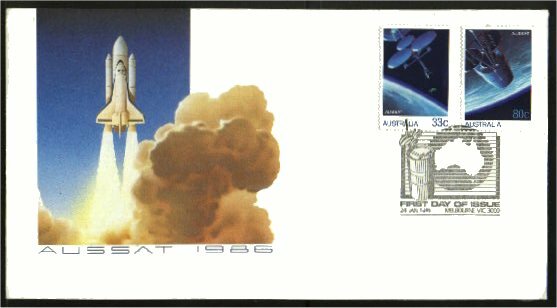 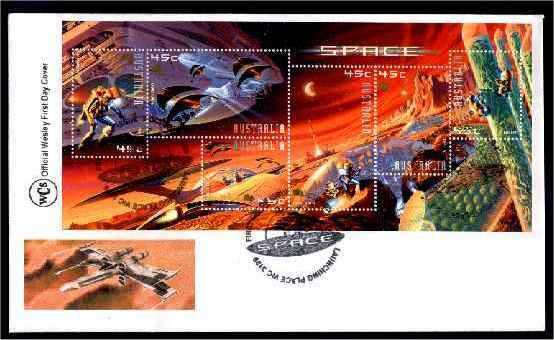 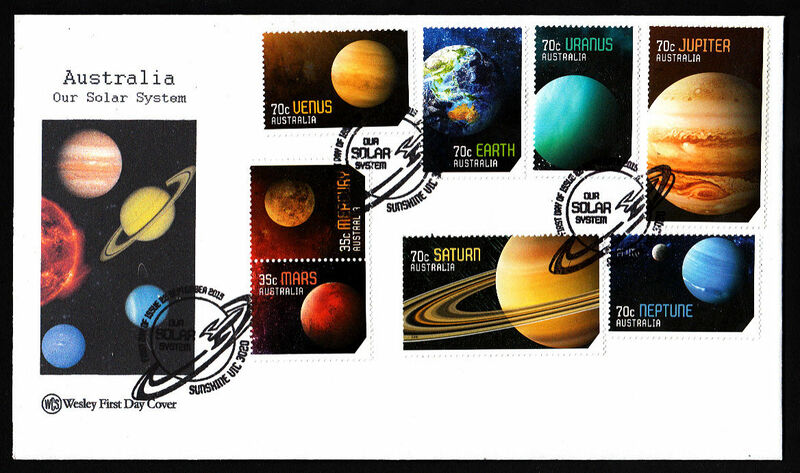 Note that although the stamp did not have a space related theme, the associated postmark and some FDCs did. 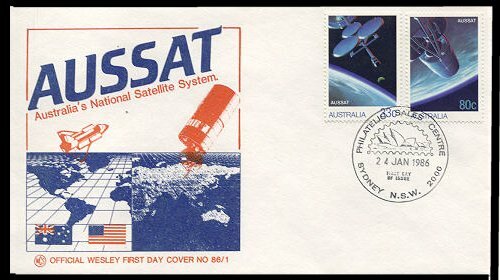 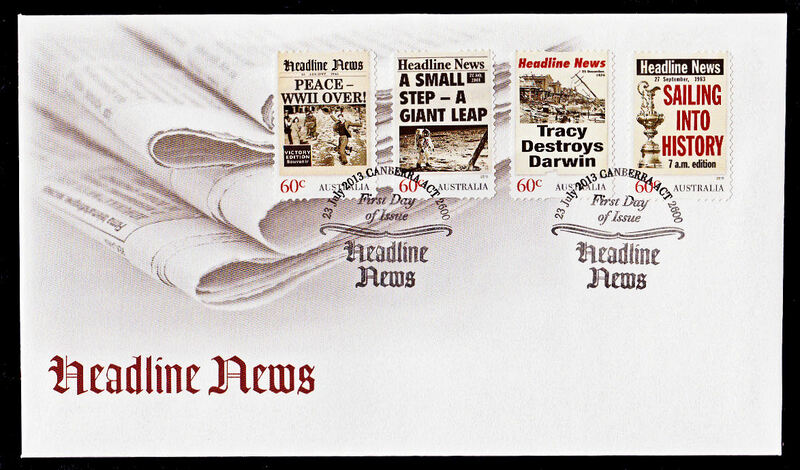 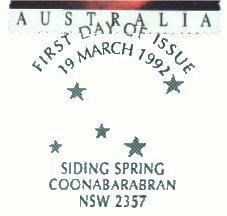 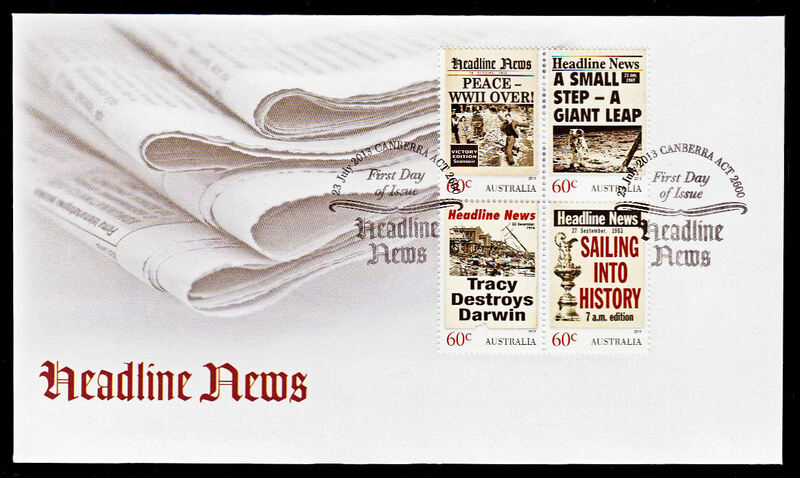 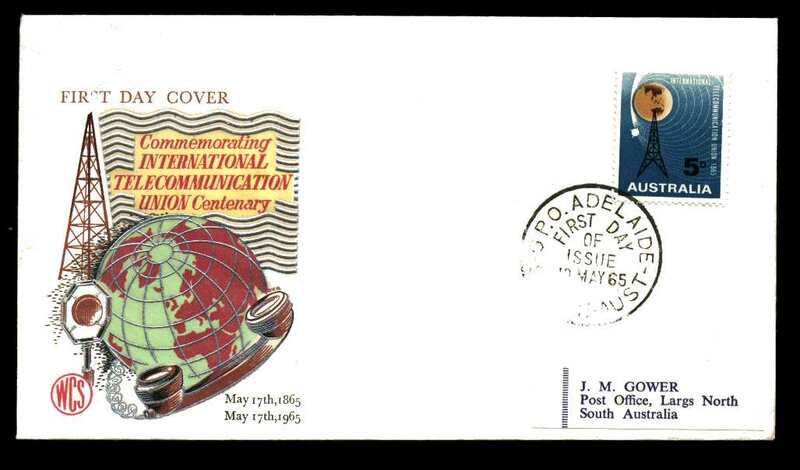 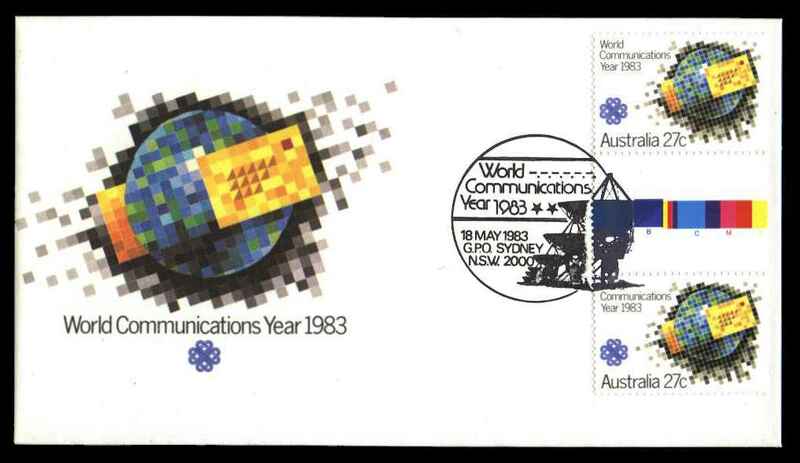 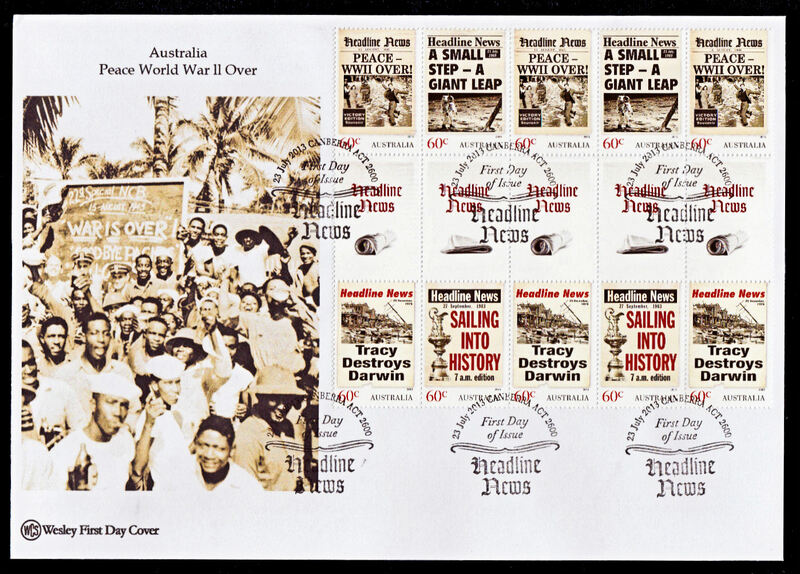 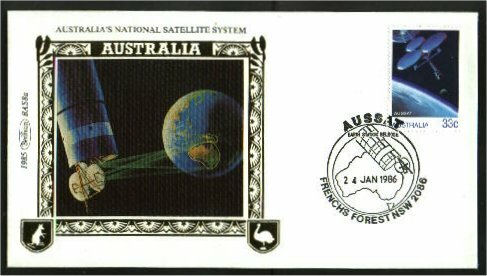 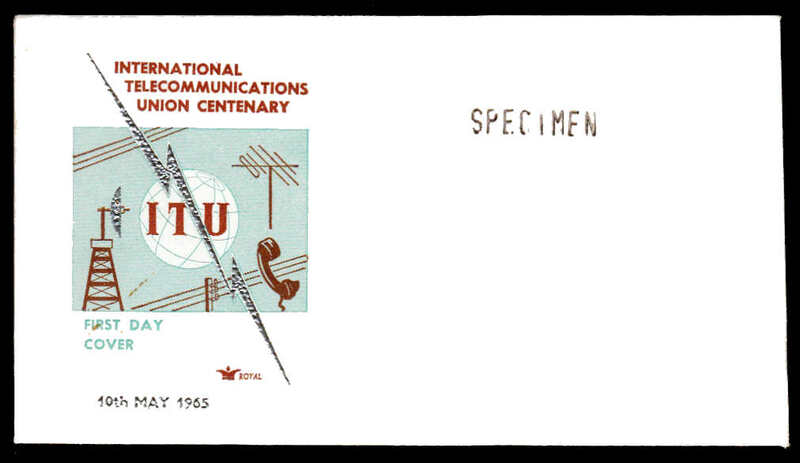 FDC Booklet Stamps on Aust. 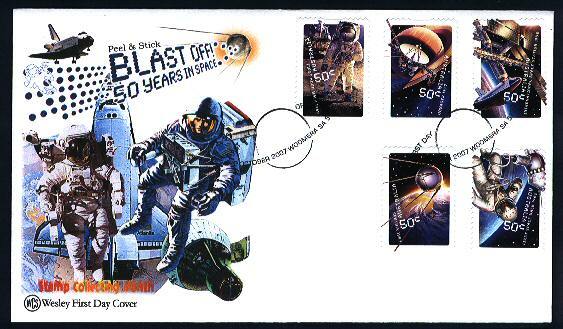 Post FDC Unofficial FDC of 4 x 70c booklet stamps postmarked at Rose?